Yep, we rolled into Washington on May 17th last year. Very hard to believe that a year has already passed since our adventure on the road ended. We reminisce often about places we have been, people we met and all of the memories that filled our amazing two-year journey. May has been an awesome month. It started with a birthday celebration for me on Cinco de Mayo. 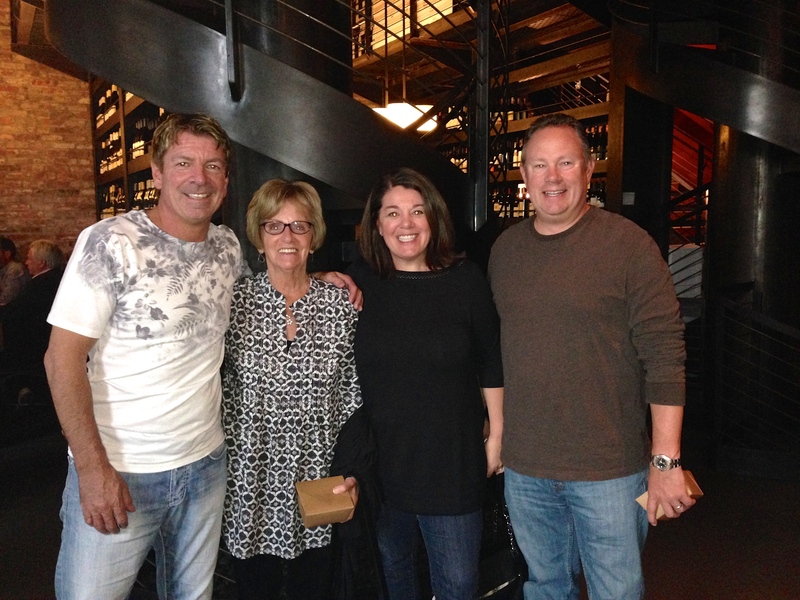 Had a great dinner out at one of my faves, Purple Café in Bellevue with Mike, my brother and Mom. It has been a long time since we have celebrated as a family, so that really meant a lot to me! We followed that up with Mother’s Day at Emerald Downs. Not quite the Kentucky Derby, but a fun day at the track and again time spent together with family celebrating Mom! 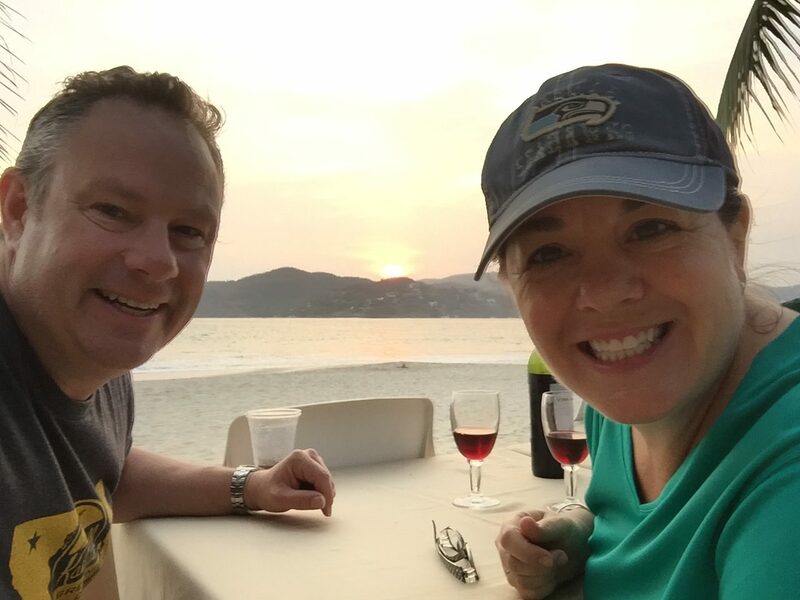 On May 10, we flew to Zihuatanejo, Mexico for a week with our good friends, Bruce & Vickie. 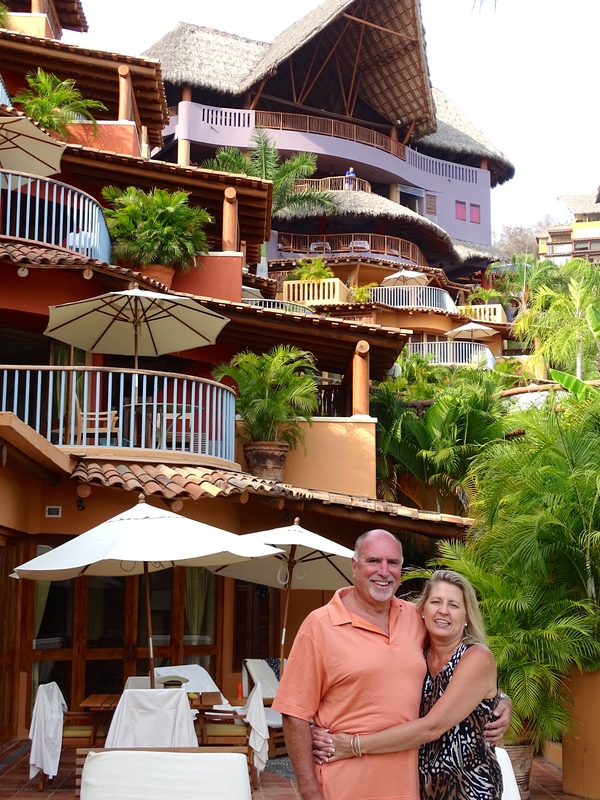 They invited us to their timeshare at Club Intrawest, and what a spectacular place! It was pretty toasty and humid, but oh so relaxing. A lot of time was spent in the pool just chillaxing. 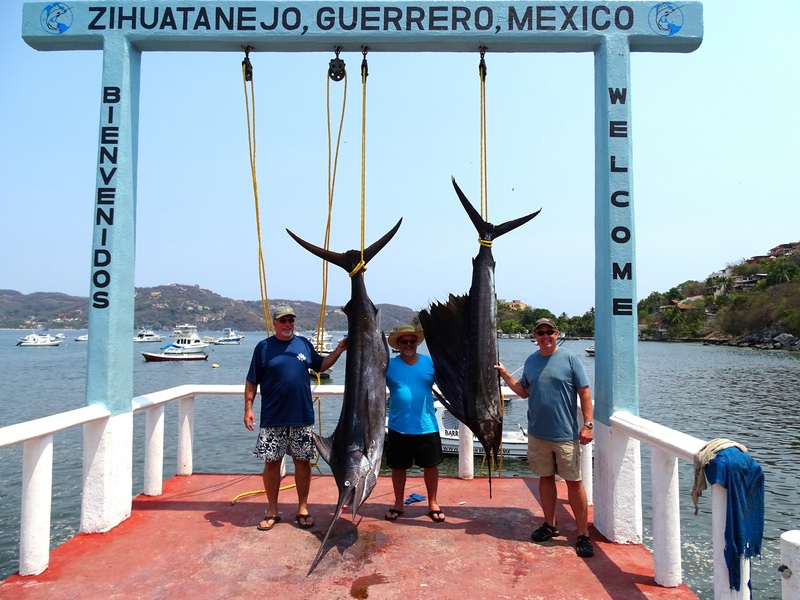 The boys had a banner day of fishing and caught a 9-foot marlin and 7-foot sailfish. The captain claimed the fish as his own to sell at the fish market, but did give them a few pounds, which they prepared multiple ways over the course of a few days. 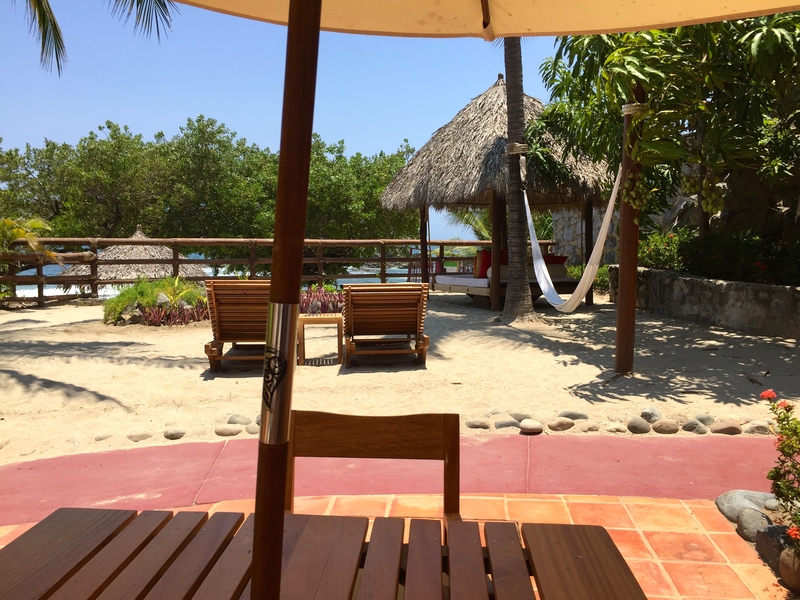 We walked on the beach, did a mescal tasting (grody), swam with the dolphins, met some great people, ate good food and basically just enjoyed a week of doing a whole lot of nothing. As usual, a week went by way too fast, but what a great week it was! Dinner on the beach. Nothing better than toes in the sand! The night before we left on vacation, we found out that we got a house to rent that we were really excited about. It is in Newport Hills in Bellevue, close to where our old house used to be. We move in July 2 and can’t wait. We are ready to leave townhouse living and have a house with a bit more space. Beyond excited! Mike’s job at Bath Planet is going well and drum roll please…I start a new job on June 1. It has been a long 4 months of job search, so I am ready to get back in the world of employment. 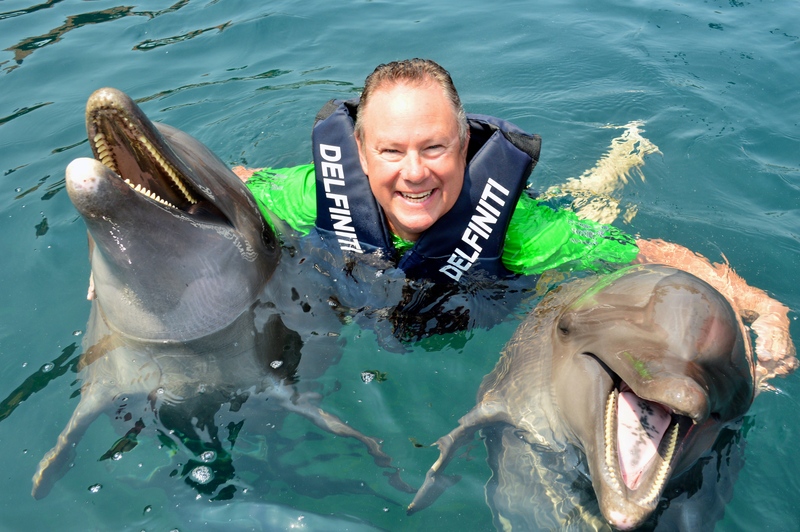 I will be an account manager for Virtuoso – looking forward to being back in the travel industry! This past weekend, we celebrated my cousin Chris and his upcoming wedding in Fiji. There was a sendoff party in Woodinville on Saturday, then we spent the day at my Aunt & Uncle’s house in Poulsbo on Sunday. My dad and his wife Jane flew up from Tucson. 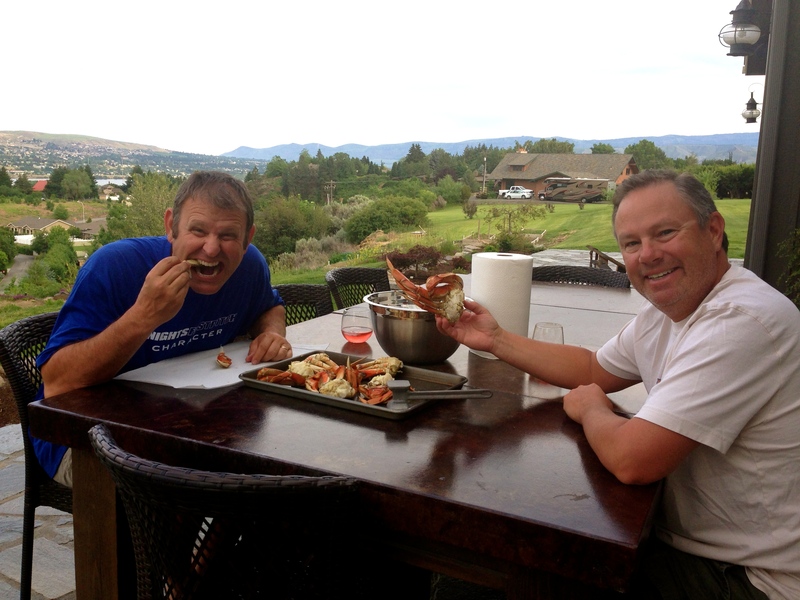 We are heading over to Wenatchee for Memorial Day Weekend to be with our great friends, Marc & Shelly. They are the ones who lost their home in the wildfire last year and they have rebuilt and moved in last week. It is unbelievable that they are back in their home less than a year from this tragic event. This is the best news! May 30 is our 17-year anniversary, so cheers to us 🙂 . Looking forward to a great summer ahead. We are finally starting to feel like “re-entry” is over and we are back in the groove! This entry was posted in May 2016 and tagged Emerald Downs, Family, Poulsbo, Purple Cafe, re-entry, Zihautanejo on May 25, 2016 by Traci. Hello everyone. I know it has been quite some time since we have posted. Even though our travels are over (for now), I thought I would check in and share some pics from last weekend when it was 85 in Seattle. We are breaking records for April! 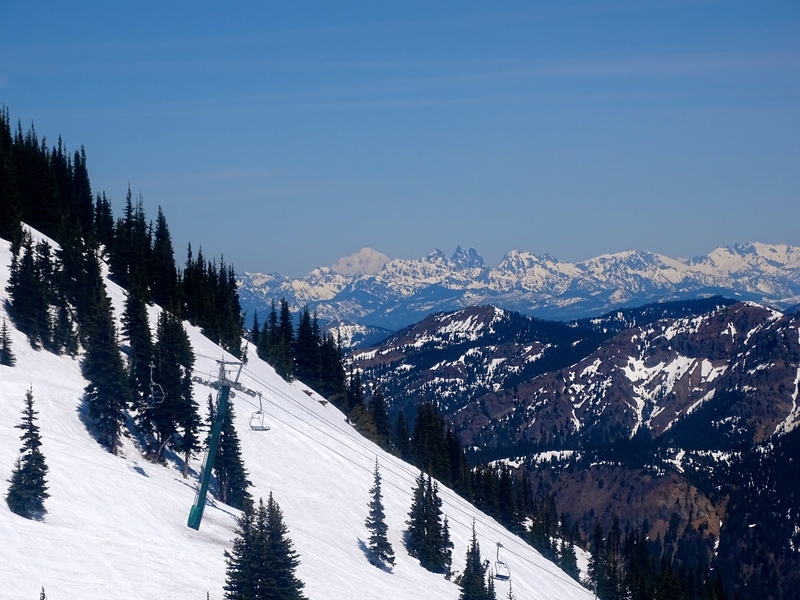 On Sunday we decided to drive up to Crystal Mountain Ski Area. It was the last day of the ski season and a gorgeous sunny day. 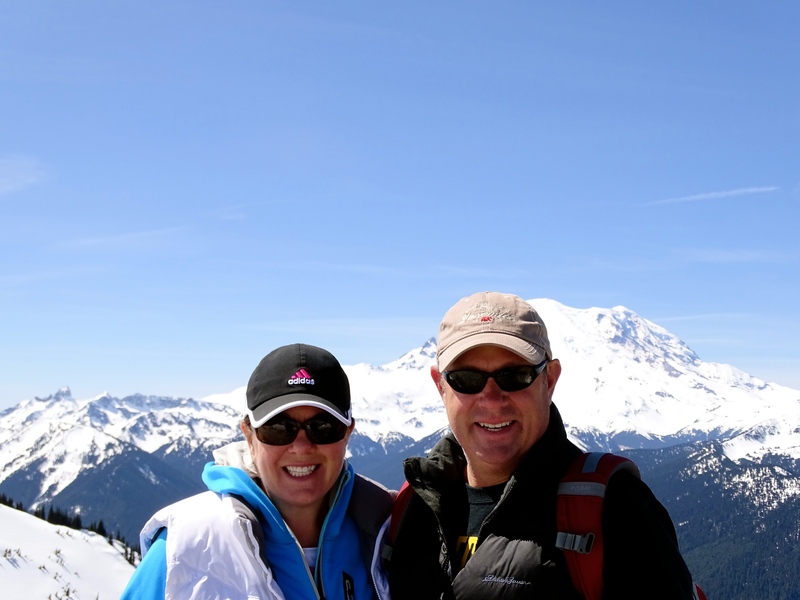 We both haven’t skied in quite some time, but a friend gave us a recommendation to take the gondola up to the top for amazing views of Mt. Rainier and the Cascades! The drive to Crystal was about 2 hours from Bellevue. We bought our $20 ticket and bundled up for the trip. While it was 85 at the bottom, the temps up top were around 50. 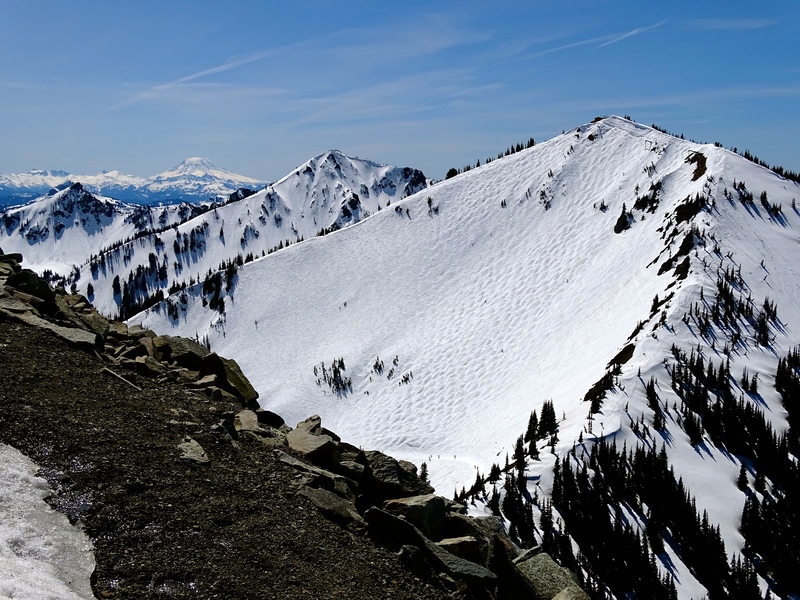 The gondola climbed about 2,500 ft to an elevation of 6,800 ft at the Summit House Restaurant. The wind was howling at the top, so we were glad we packed the extra layers. There was an outdoor bar made of ice with music cranking and plenty of chairs to kick back in and take in the views. We stayed up top for about an hour, then made our way back down to the deck at the base and enjoyed a beverage in the warmer temp. 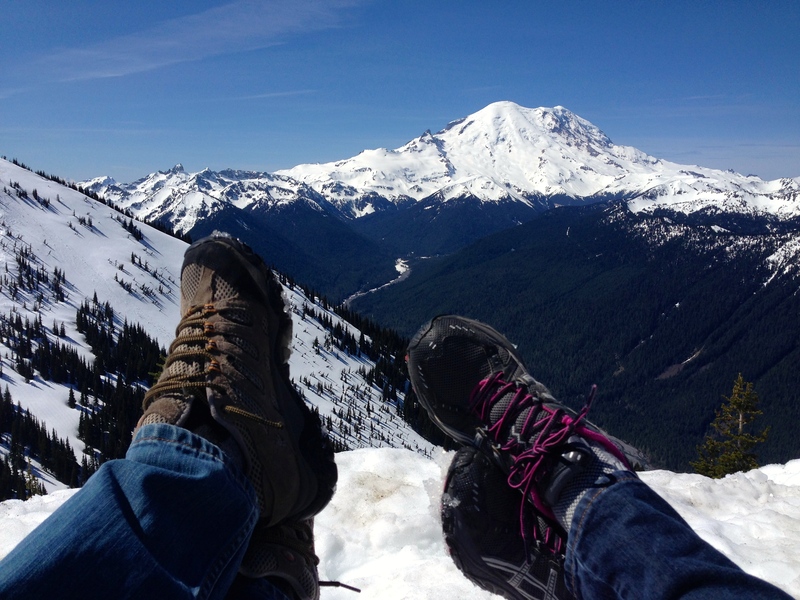 The gondola is open in the summer months too with access to miles of hiking trails. Highly recommend! Mike is now working for Bath Planet, a tub/shower remodeling company, doing in-home sales. My marketing contract at Savers ended in January, so I am back on the hunt for the next opportunity. Our lease at the townhouse is up at the end of June. Hard to believe we will have been home a year! We are pondering our next step, but will most likely be renting again (housing market is ridiculous). 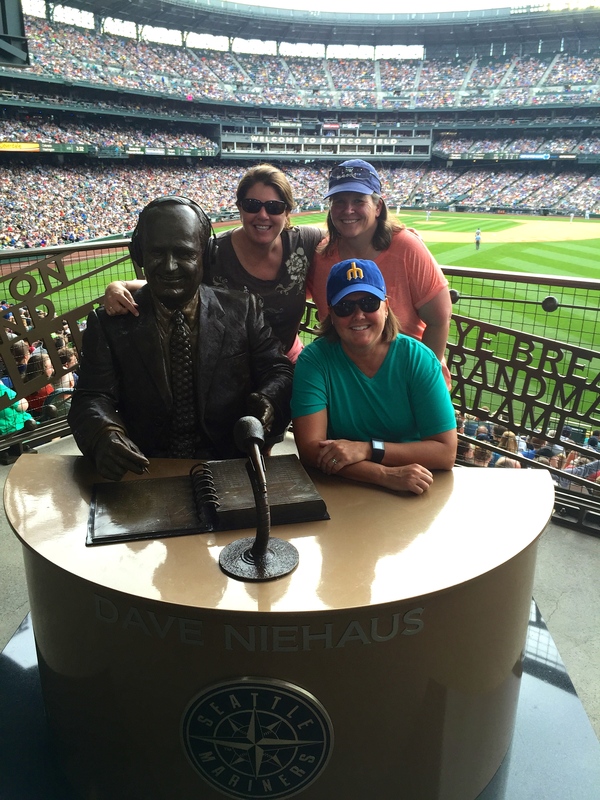 We are enjoying reconnecting with friends and family and taking in Sounders, Seahawks, Mariners and Husky (Mike) games. 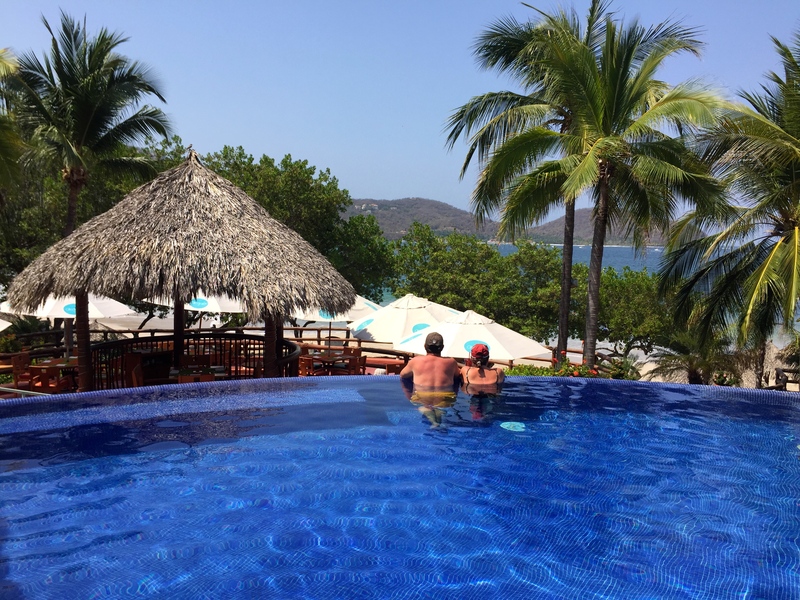 We are looking forward to a trip to Zihuatanejo, Mexico in about 3 weeks! We are going to try to post a little more regularly. Hope everyone is well and happy! This entry was posted in April 2016 and tagged Crystal Mountain, Mt. 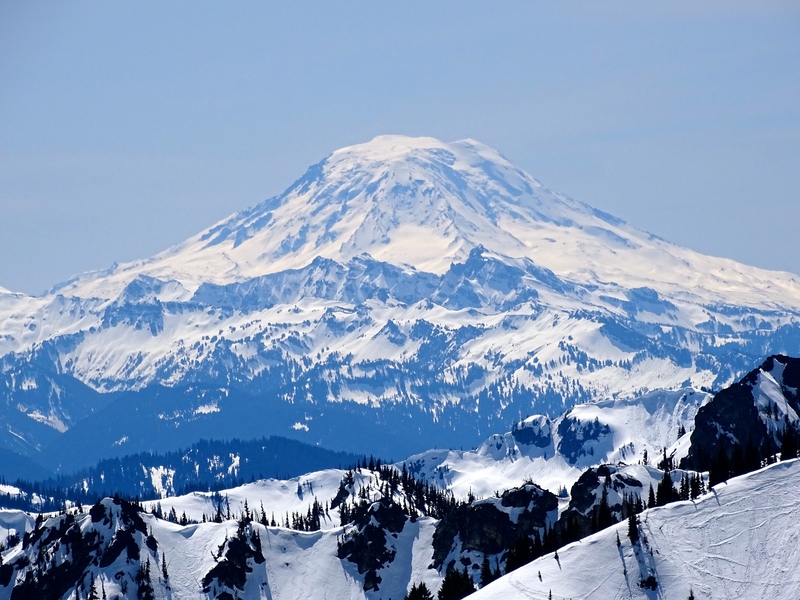 Rainier, re-entry, Seattle on April 20, 2016 by Traci. Hello all! I can’t believe we have been back in Washington for 3 months. Stating the obvious, but time flies! Thought I would give you an update on our “re-entry” progress. 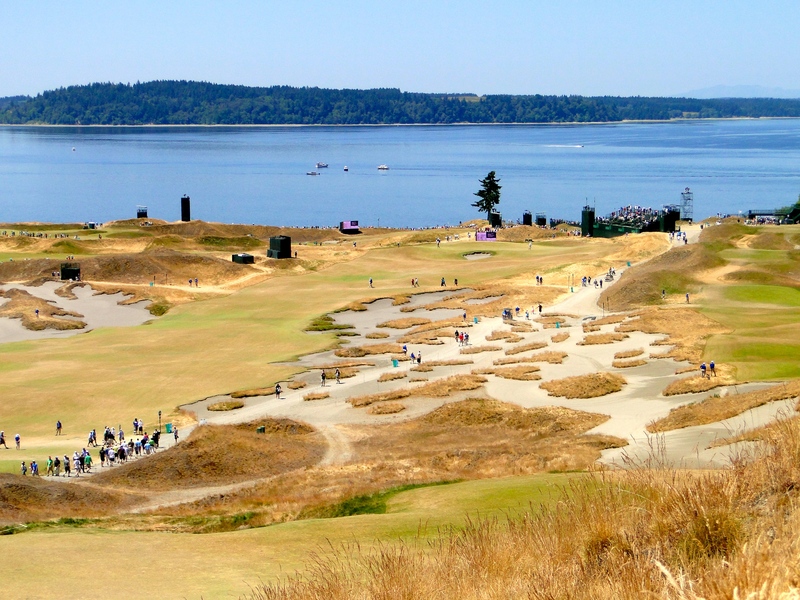 Last time we wrote, we were at the Puyallup Fairgrounds for 10 days volunteering at the US Open Golf Tournament. It felt like we were still on an adventure living in the MoHo so not quite back into reality. 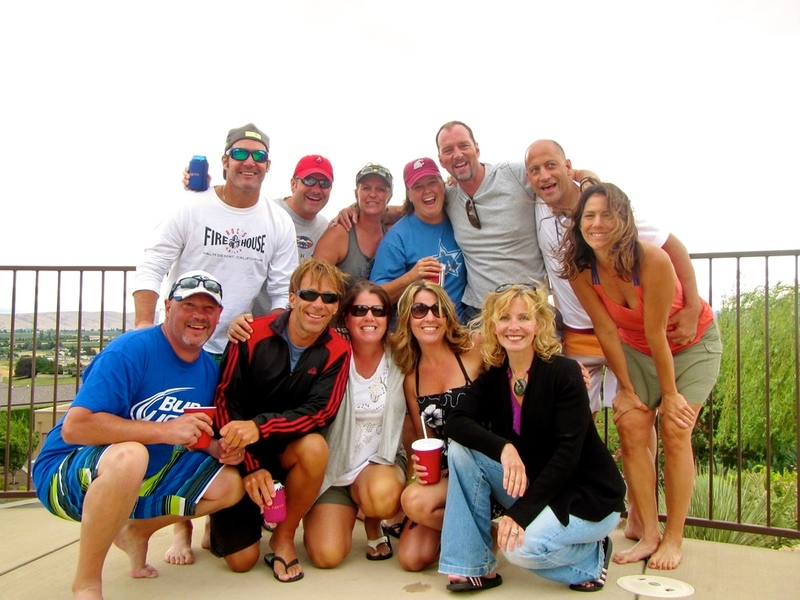 We had a few different friends (Pflu’s and Detroit’s) come and stay with us to attend the golf tourney, which was fun. I think Mike enjoyed the volunteering more than me, but we loved having a free pass into the tournament and took full advantage. On the final day, we opted to just watch from the comfort of the MoHo since we had already been hiking around the course for 6 straight days. A good decision as we could actually watch some golf. 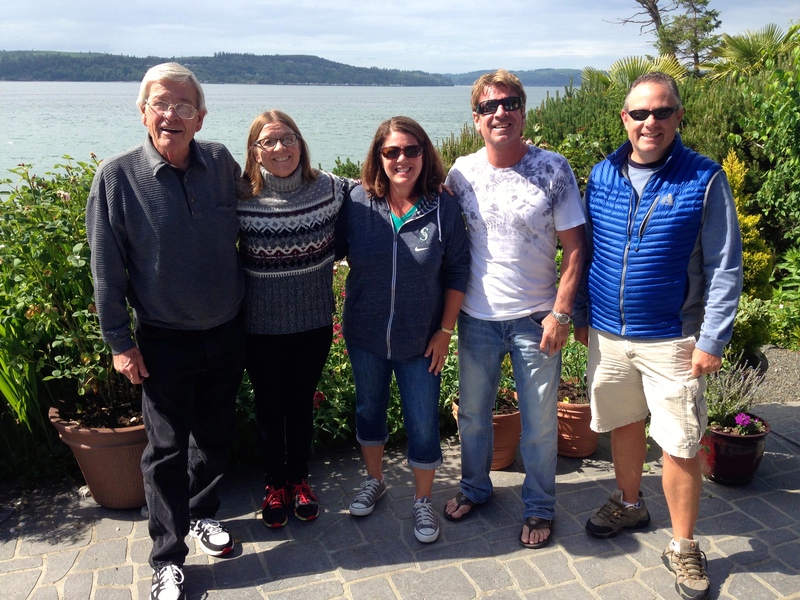 After we left Puyallup, we settled in at the KOA in Kent for a week as we continued our search for a permanent place to live. My expectation of this process was way off base. Throughout the month of June we toured over 30 properties and drove by at least another 50. The housing market in Seattle is off the charts crazy right now, so it was quite a bit more competitive and challenging than we thought. Finally, we found a place that we felt pretty good about and jumped on it. No time to “think about it” as someone else would have come along and nabbed it. We settled on a townhouse in Bellevue and moved in July 1. It is a great location, but the place is a little older than I would have liked. But, we have a full garage with plenty of storage space, so we were able to clear out our storage unit which was great. And, I LOVE that we have a dishwasher and washer/dryer – the little things that make me happy. We are now in 1,400 square feet of living space vs. the 350 square feet of the MoHo. However, the kitchen is about the same size! We are committed here for a year lease, so we have some time to figure out our next step. A funny side note is that I lived in this same complex about 17 years ago with some girlfriends. Getting a vehicle for Mike was also on our to-do list. This one was easy, as he knew exactly what he wanted. It was just a matter of the dreaded negotiation and car dealer BS. Luckily, he had worked with Toyota of Bellevue before, so it was pretty painless (except for the new car payment). 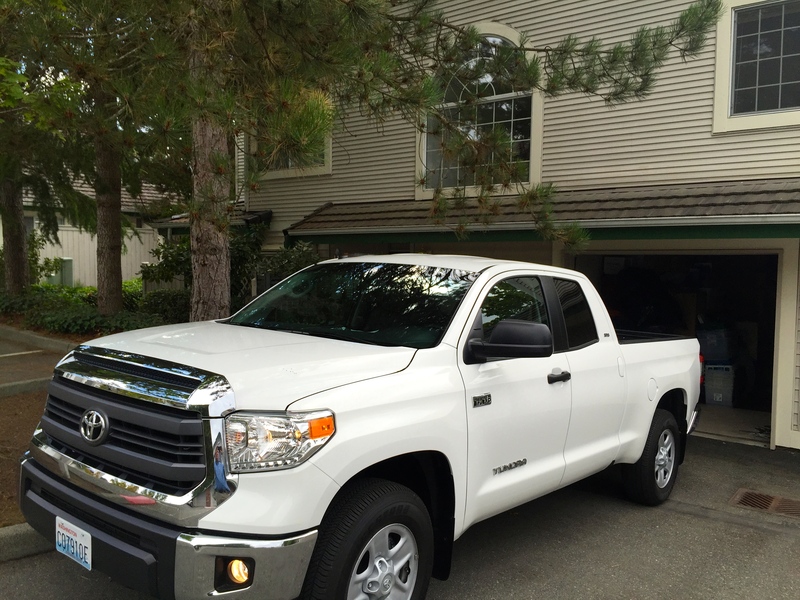 We are now the proud owners of a 2015 Toyota Tundra truck! Mike is a happy camper! We are now both working and what an adjustment that has been. Mike is working for the National Cremation Society doing in-home sales. Right up his alley and while it is a unique product to sell, it is one that is always needed. He has the patience and demeanor to discuss this difficult topic with customers and loves the flexibility that outside sales brings. While Mike was one and done (one resume, one interview, one job offer), my journey has taken a bit longer and is still in process. Currently, I am employed through Simplicity Consulting on a 3-month marketing contract at Savers. They are the parent company of Value Village and the corporate headquarters are here in Bellevue, a glorious 5-minute commute (did I mention the horrible traffic situation in Seattle?). I am committed through Oct. 31 at Savers, then it will be time for another contract or hopefully I’ll be onto finding a full-time position somewhere. The last piece of the puzzle for us is to sell our beloved MoHo. It was in the shop at Camping World in Fife for 7 weeks getting some warranty work done. Most of that time, it was just sitting waiting. We were beyond frustrated with the lack of customer service we were receiving and the absence of communication and common courtesy. We finally reached our boiling point and had to elevate our issues to the corporate office. Miraculously, our parts came in and the MoHo was fixed within a few days. So, now we have her for sale at Kitsap RV in Bremerton. We figured consignment was the best option for us, especially since we don’t have storage. So, hopefully a buyer comes along soon. A little bittersweet though. Other than all of that, we have been busy reconnecting with friends and family and getting reacquainted with the area. We are looking forward to being in town for the Seahawks season and Mike can’t wait for Husky football to start. It is great to be home, but of course we miss the freedom and carefree lifestyle of being on the road. We have booked a few trips/weekends, so we have some fun events to look forward to. The weather in Seattle this summer has been fabulous so that has eased our re-entry. We really do live in a beautiful part of the country! For all of you who we met on the road, come visit. We would love to see you! 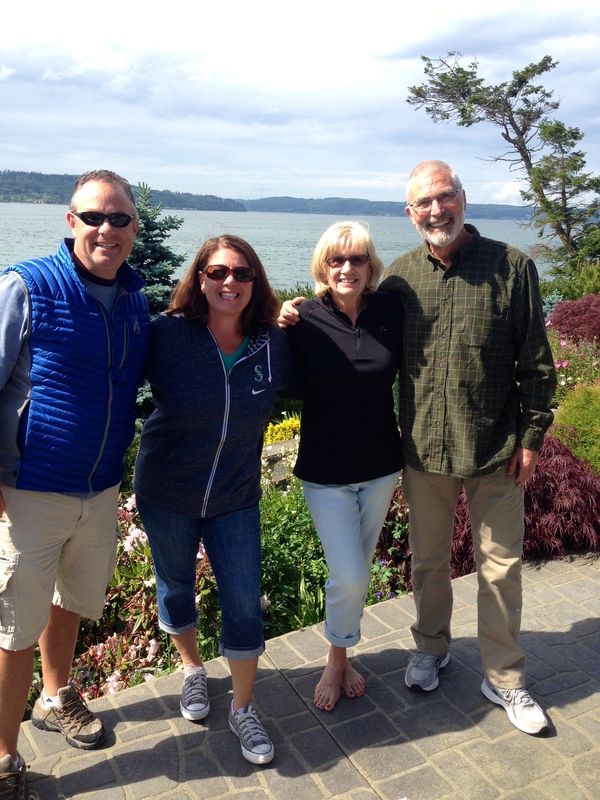 Annual Pool Party at Camp Cameron – this pic represents 4 different years of Shorecrest High School graduates. 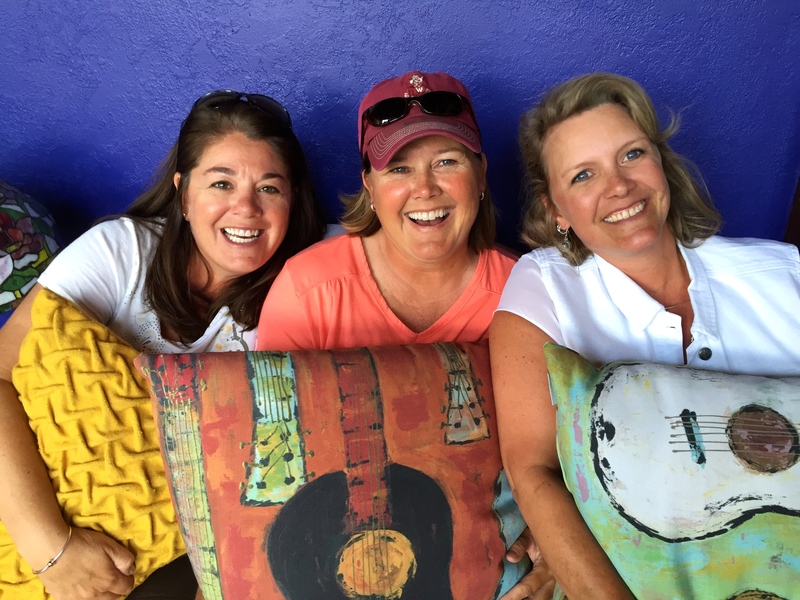 Still friends 30 years later! 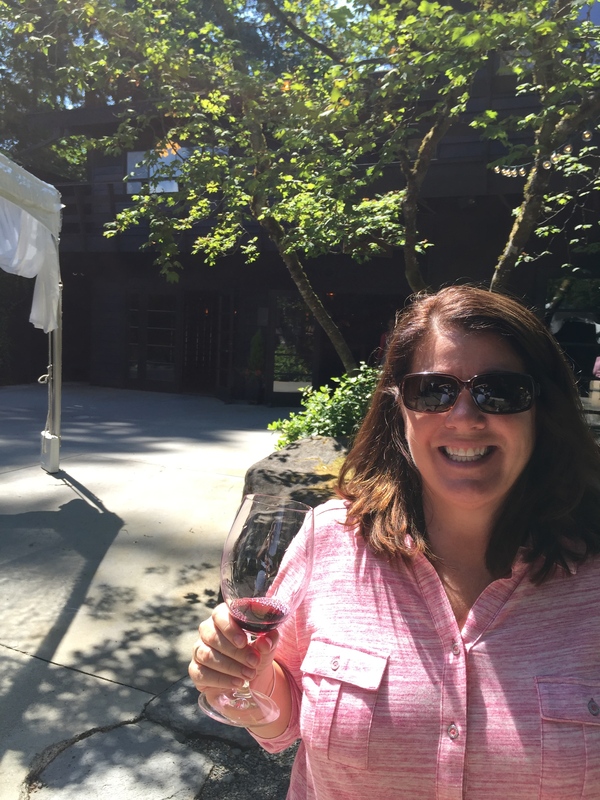 This entry was posted in August 2015 and tagged Bellevue, job search, national cremation society, Pool Party, re-entry, Seattle, Shorecrest Hight School, Toyota truck, US Open golf tournament, Washington on August 30, 2015 by Traci. Miles driven in the MoHo: 2,700 miles from Texas to Seattle – bringin’ her home in March 2013. Number of campgrounds: 164 different places, several we returned to a second time. Least favorite states: Not going there! Number of bugs hit: Millions! Number of pictures taken: Well over 15,000! Selfies taken by Mike: Too many to count! Stormiest weather: Kansas City, MO – Thunderstorms shook the MoHo! In St. Louis, MO we were in a Tornado Warning, but no issues thank goodness. Shreveport, LA – we sat in the front seats and watched the lightning! Baseball Parks attended: St Louis – Busch Stadium (Mike’s favorite); Cleveland – Progressive Field; Boston – Fenway Park; Denver – Coors Field; Baltimore – Camden Yards. College Football games attended: WSU vs. Cal and UW vs. Stanford (both of those on the same day! ), UW vs. ASU, Iowa vs. Northern Iowa, Nebraska vs. Illinois and Mississippi St. vs. Arkansas. Looking back, we realized this is a very impressive list, seems even more so after researching all of our travels. 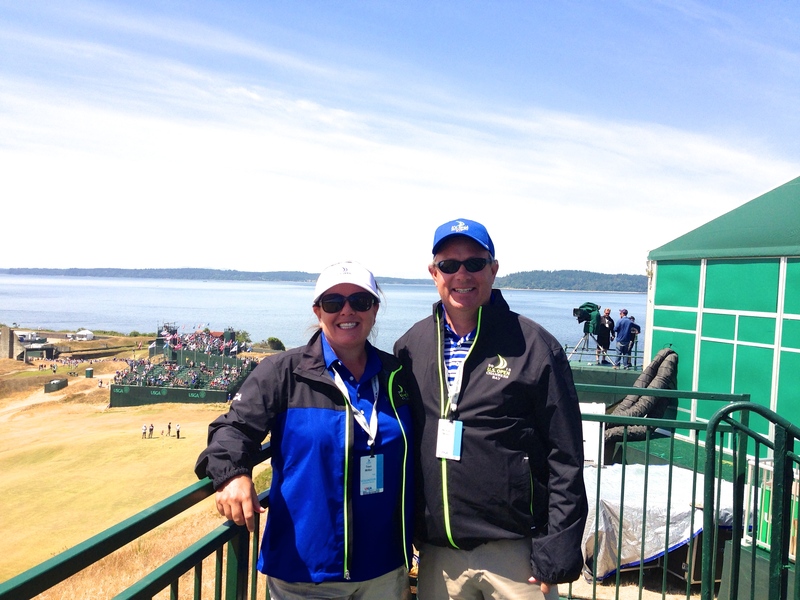 We are now spending 10 days in Puyallup at the fairgrounds, using this as our home base for our volunteering at the US Open at Chambers Bay. We are looking for a place to live in the Bellevue/Eastside area, jobs, and selling our beloved MoHo. What an amazing adventure for sure! 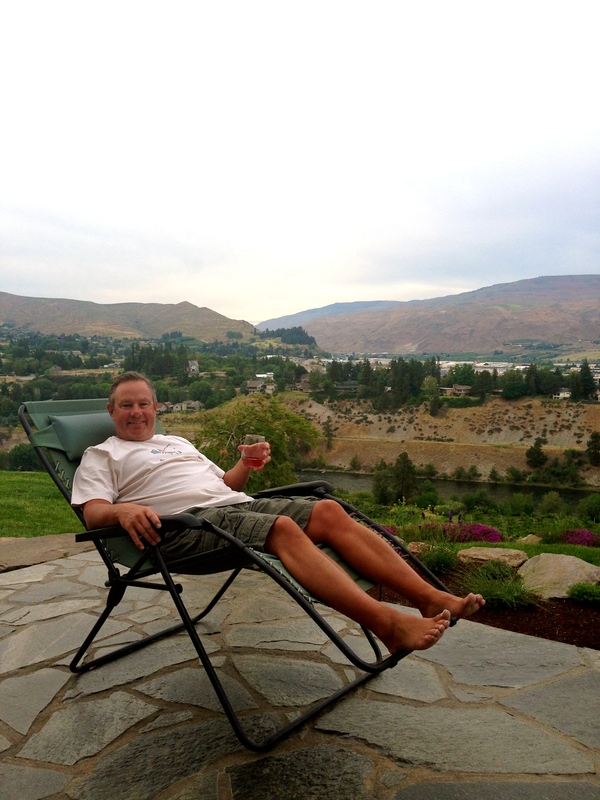 This entry was posted in June 2015 and tagged MoHo, Roadtrip, RV Travels, Trip Stats on June 14, 2015 by Mike. 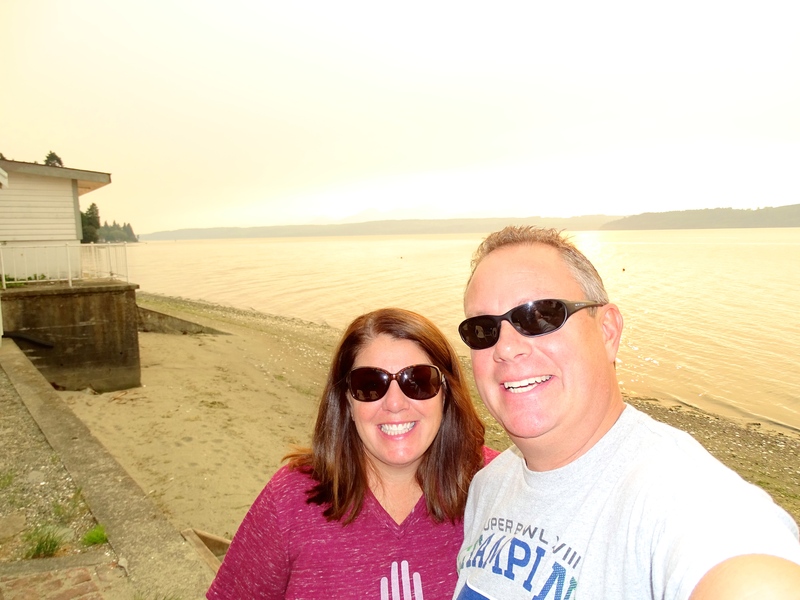 We entered Washington via Idaho into Clarkston for a quick one-night stay at the Granite Lake RV Park. What a weird feeling to be back in our home state after all of this time. 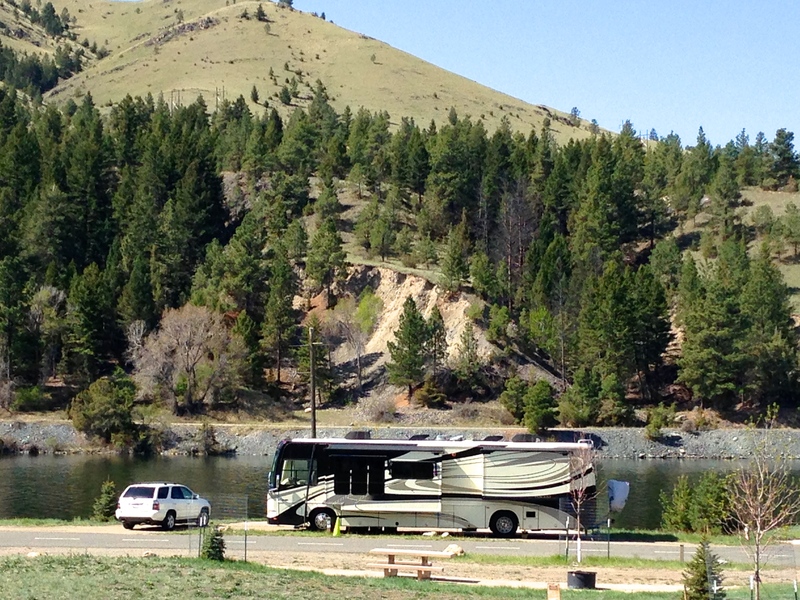 Our campground was in a beautiful location right at the confluence of the Clearwater and Snake Rivers. This was just an overnight to break up our long drive before heading to Walla Walla. The next morning, I loved the drive east as it felt like I was back in the Palouse! We arrived at the Blue Valley RV Park in Walla Walla, our home for the next 3 nights. It was a perfectly located park, just a mile to the downtown area. 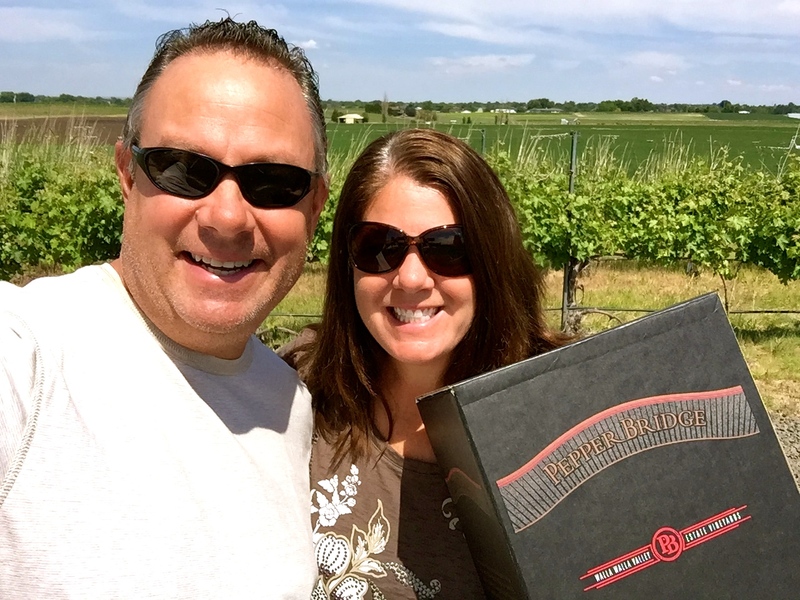 We were here to visit friends, Don and Trudy, and of course do some wine tasting. The weather was perfect and we were able to visit some places we had not tried before as well as some old favorites. 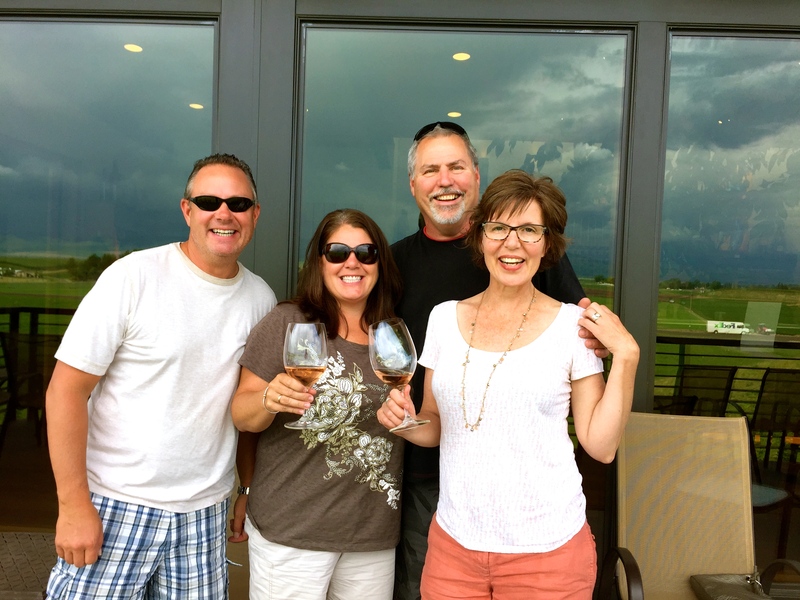 We had a great dinner out with Don and Trudy and a lovely afternoon on the Amavi Cellars deck with them sipping a delicious Rose. So great to be able to see them on our way back home! 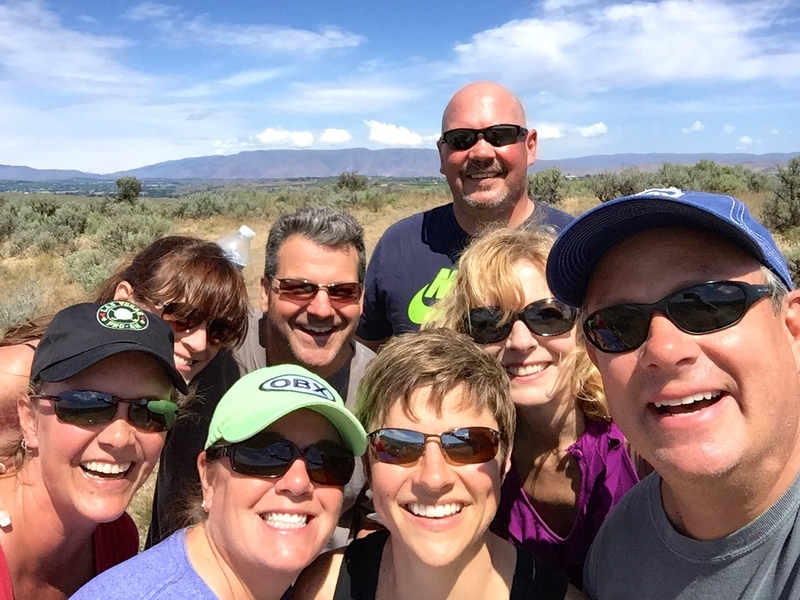 Next up was Yakima and Camp Cameron for Memorial Day Weekend. Well, we actually stayed a full week, but we had a few friends come and go throughout the weekend. 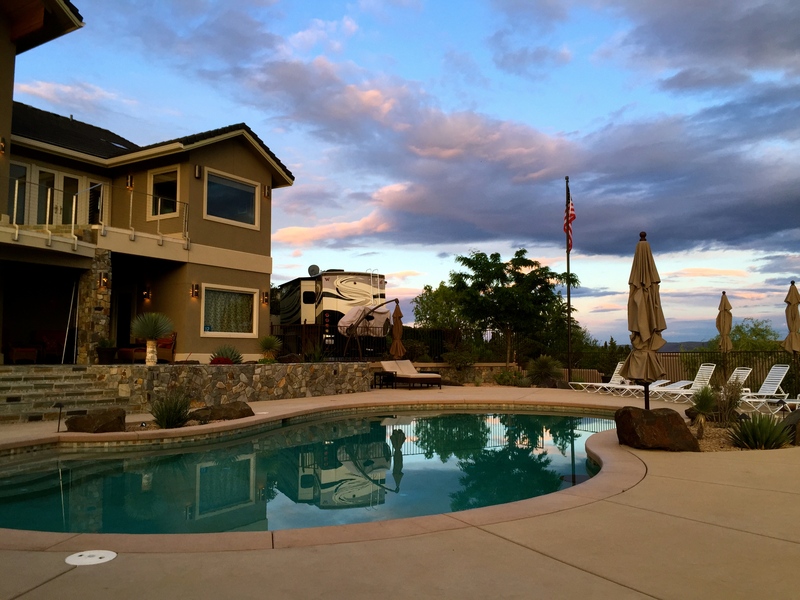 Sunny & Mitch have a perfect set up for our MoHo with full hook-ups right in their driveway. 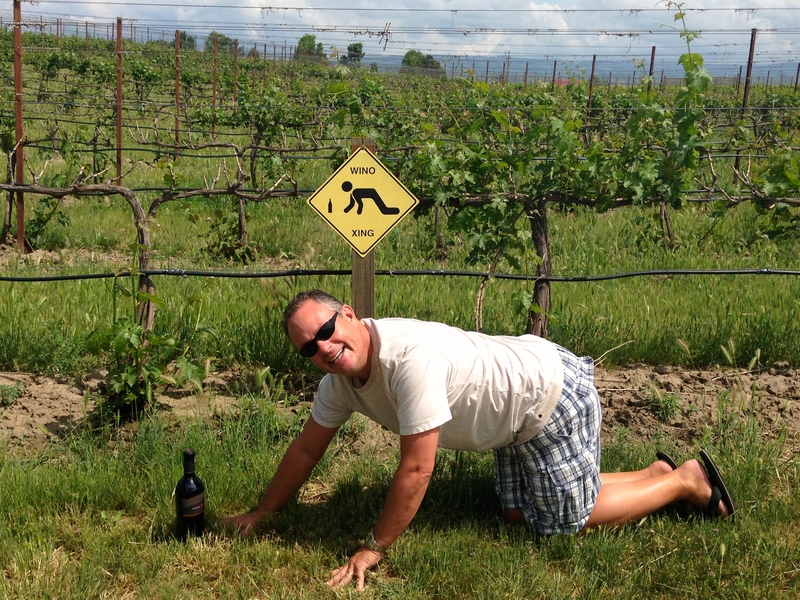 We had a great time catching up with friends, hanging by the pool, wine tasting, hiking and storm watching. We were even able to clean out the entire “basement area” of the MoHo and organize a bit in preparation for putting it up for sale. We said goodbye to them on Thursday morning and made our way to Wenatchee (we left the MoHo parked in their driveway and just drove the car). Huge thank you to them for this and their hospitality! 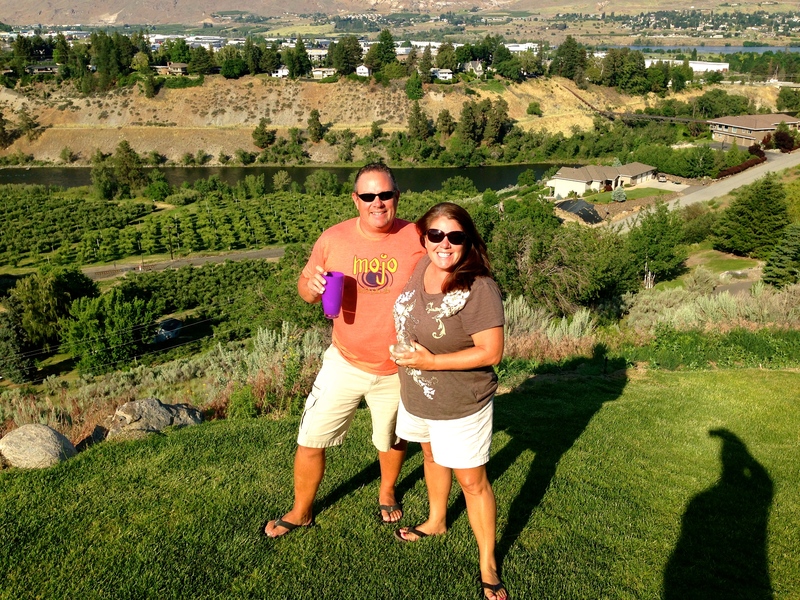 Next stop was Casa de Pflu in Wenatchee to see our other great friends, Marc & Shelly. We spent 4 nights there hanging with them and just enjoying the views from their home, cooking and watching softball and movies. Got a lot of errands done in anticipation of our arrival to the west side. Our 16th anniversary was on May 30 so we had a delicious celebratory dinner with them. The time was too short and before we knew it, Monday June 1 had arrived, our official re-entry date. Big thanks to them for hosting us on our final destination! 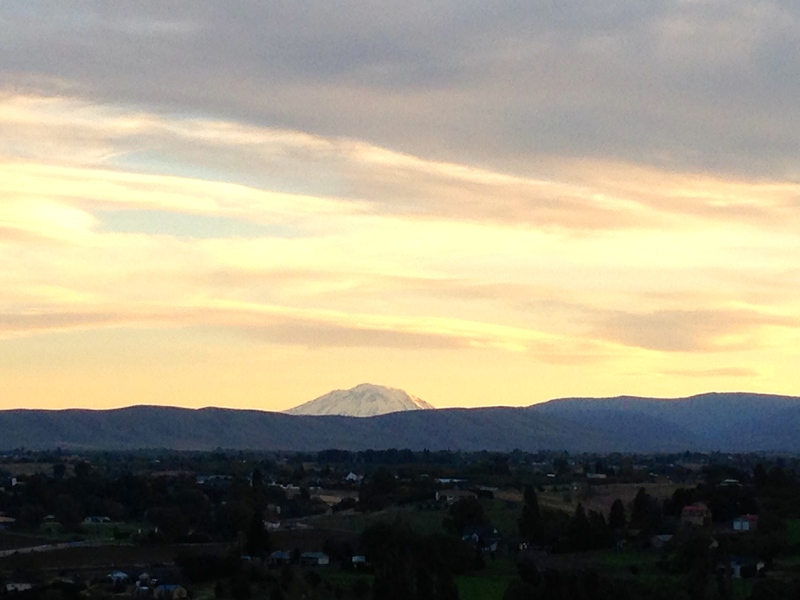 We left Wenatchee, drove to Yakima to get our “house” and headed over the mountains to Bellevue for official re-entry. I can’t believe this time has actually arrived. What a ride it has been and such a great adventure for us, full of amazing memories. Our home for the next 10 days is Vasa Park in Bellevue, then we take the MoHo to the Puyallup Fairgrounds while we volunteer at the US Open golf tourney in Tacoma. After that we are hoping to have found a place to live. Currently, we are catching up with friends and family, looking for a vehicle for Mike and a place to rent. Then, we’ll really ramp up the job search and selling of the MoHo. Lots to do, but exciting to see what the next chapter holds for us. 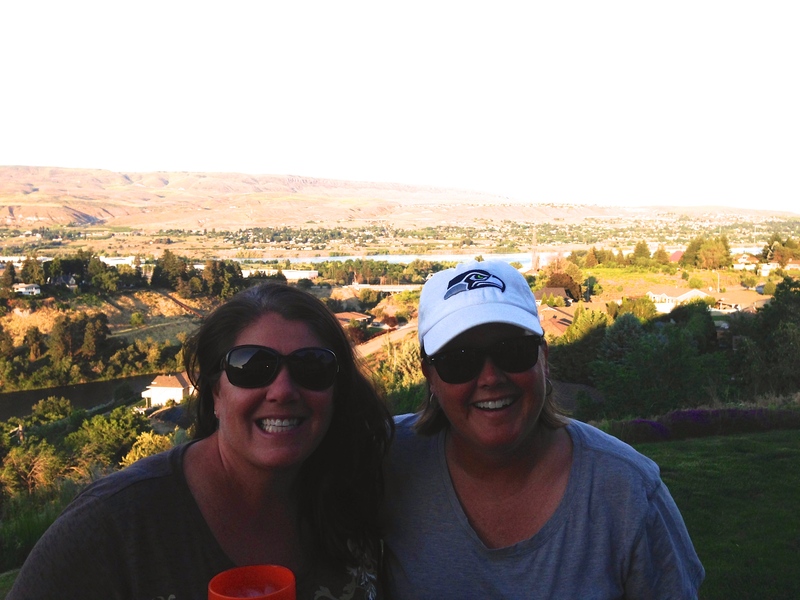 This entry was posted in May 2015 and tagged Camp Cameron, Casa de Pflu, Walla Walla, Wenatchee, wine tasting, Yakima on June 2, 2015 by Traci. As many know, Montana is a big state and there is a lot of diversity in the landscape, more than we realized. We planned our trip through with several stops along the way, spending two weeks, and seeing a lot along the way. Our first stop was the Billings KOA, located right on the Yellowstone River on the western side of town. We made the most of the day we were there, driving though the downtown area, hitting a brewery, rock combing on the rivers edge, and a fire at the campground before retiring for the night. We enjoyed the stop and campground, a great start on our journey through Montana. Our next destination west along I-90 was the Bozeman KOA, which is actually about 10 miles SW of town. This campground was odd for a KOA, no security with open access roads in and out, a not so great neighborhood, and plenty of construction. Not the quiet retreat we have come to enjoy. 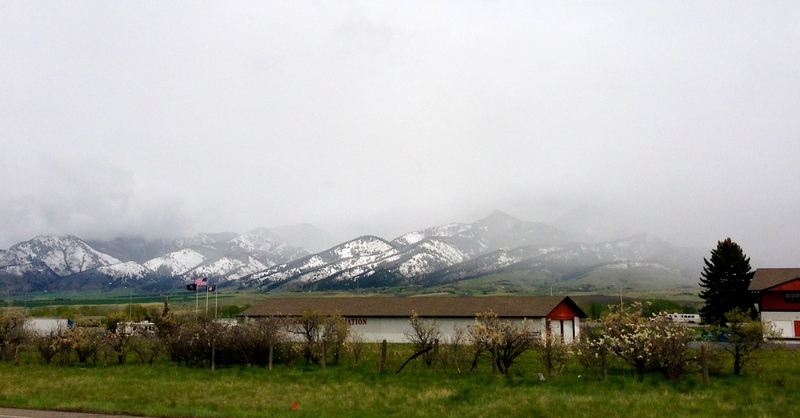 The weather was typical for a mountainous area, with plenty of rain, even a spot of snow and some sunshine; it is spring in the Rockies. 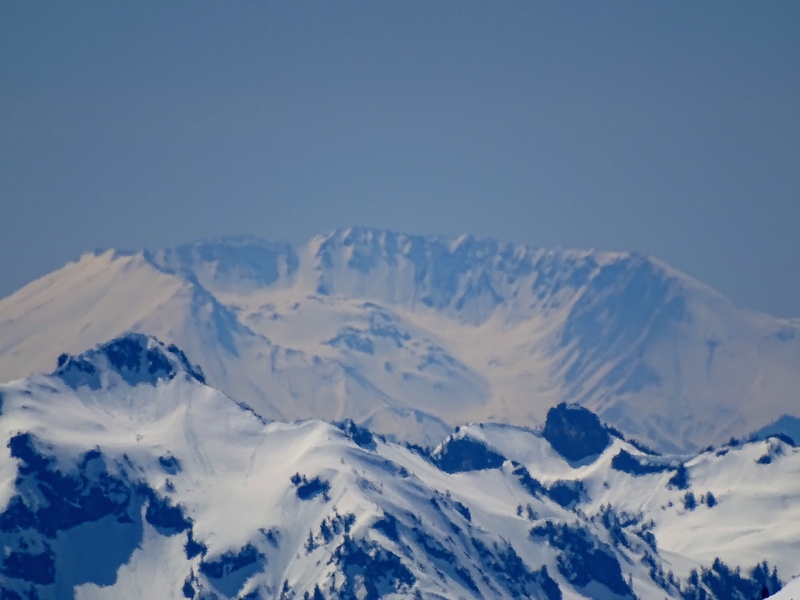 We spent one day on a trip to the Big Sky ski area and the Lone Peak Brewery for lunch and a beverage; a very beautiful area, reminding us of Whistler, another familiar feel of home. 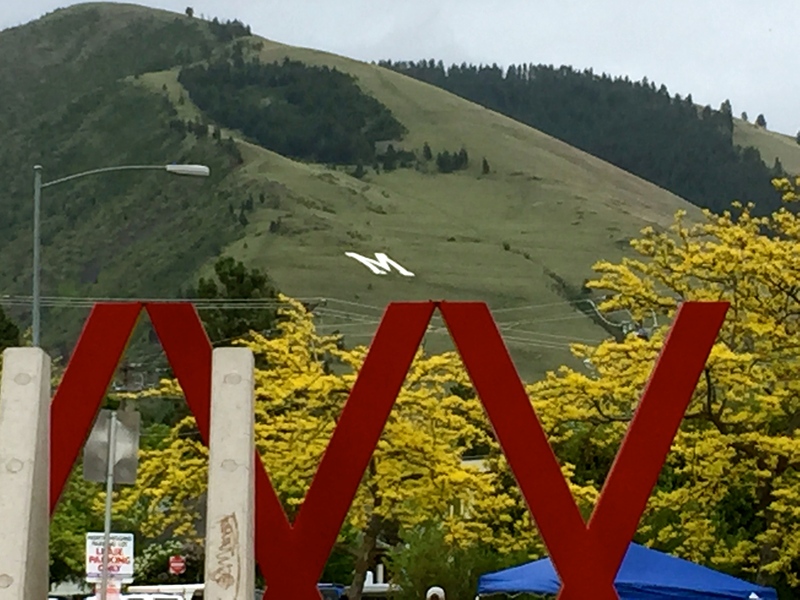 Another day we spent milling around the downtown area doing a little window-shopping and checking out the Montana State campus. We had an amazing meal at the Montana Aleworks, the best meatloaf I have ever had! On May 5th, we celebrated Traci’s birthday. We have come to find it sometimes difficult to locate that special place to celebrate events like this; unlike when we are home we have a list of great options to choose from. We had talked to some folks the evening before at the Aleworks, and had a few recommended stops for Cinco de Mayo. 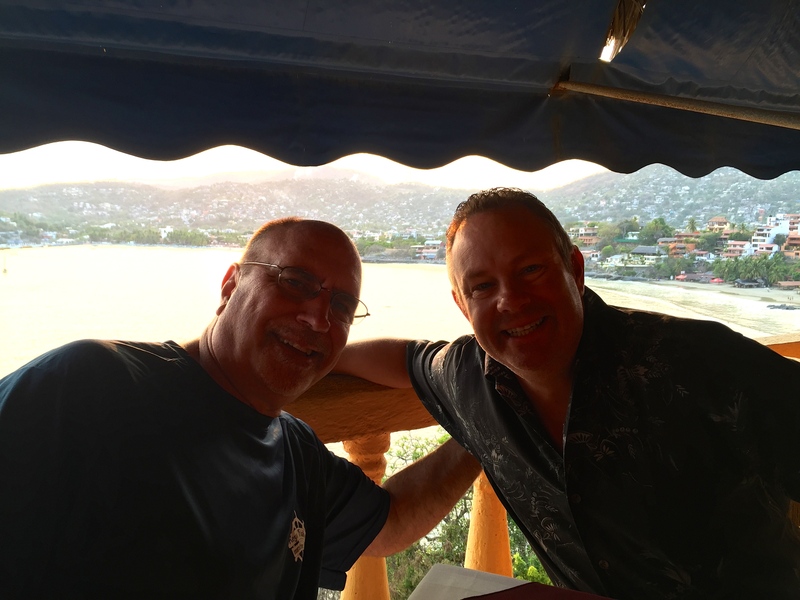 We ended the evening at a local Mexican restaurant near the KOA, and thoroughly enjoyed the night. 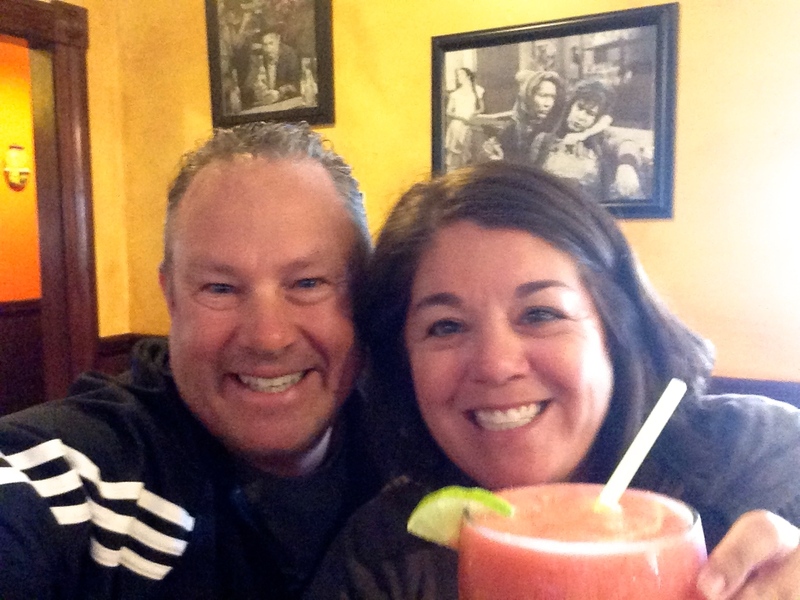 Traci found her giant-sized strawberry margarita, and I had plenty of Tequila choices. But, the best part of the place was watching the staff panicking behind the tiny, poorly laid out bar, with no direction from the manager. One of the biggest nights of the year, and they were very unprepared for sure. Birthday Girl with her strawberry marg! 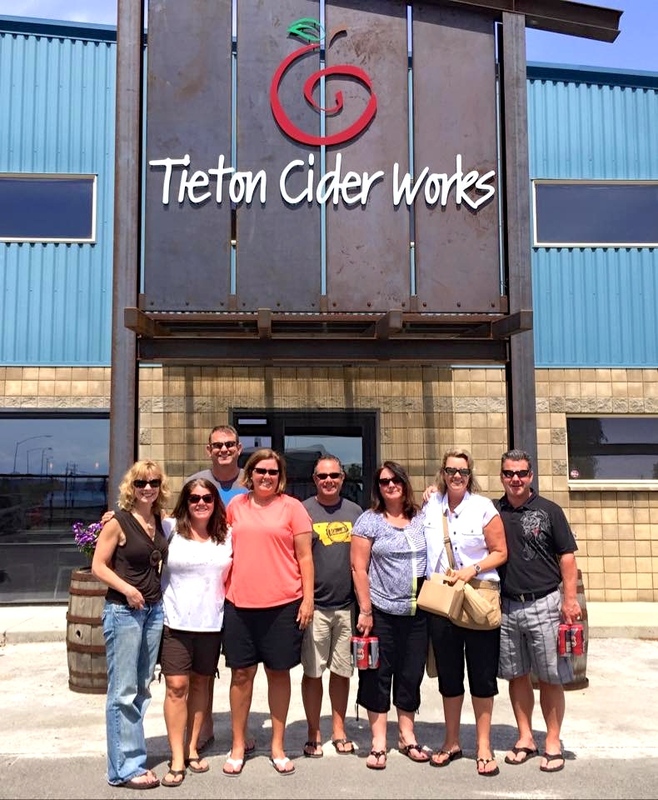 Our last day in Bozeman was our errand day. The weather was wet and cold, only in the high 40’s and we just made our way around town hitting the usual stops, Costco and Safeway. We did laundry and got the MoHo ready for our next stop, a two night “boondocking” outside Helena. We started out the drive with a quick stop at the local RV shop to top off our propane tanks, and use their air to ensure our tire pressure was good. The 90 mile drive was lowlighted by construction on Hwy 287 after we left I-90, an area that was basically a ten mile stretch of gravel road and potholes, but there was no way around it. 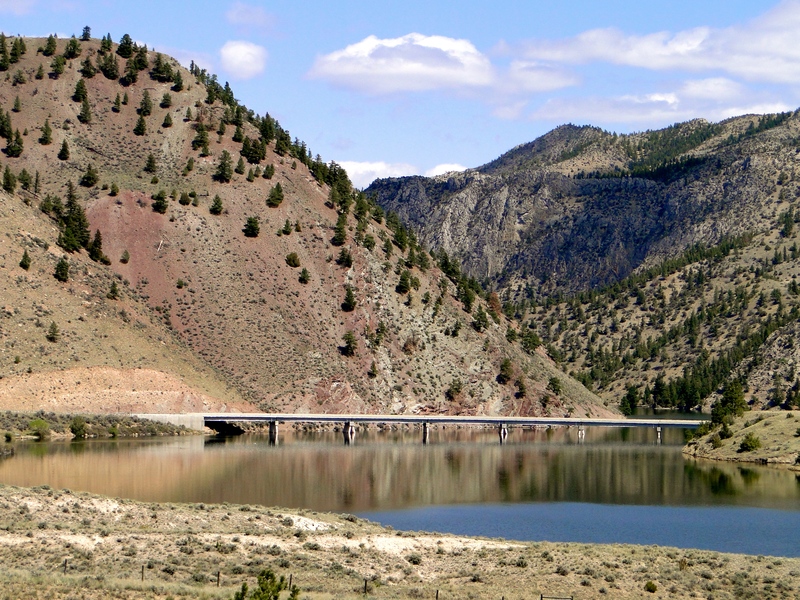 We arrived at our destination, the Riverside Campground, just below the dam on the Missouri River, east of Helena. This was our first and only adventure into “dry” camping, no hookups at all. I had made this choice of accommodations, basically looking at the map and finding what looked like a very secluded place on the water, and it was all of that and more! I made a reservation on the riverside and glad I did, each night was busy with people looking for the same type of place we had. With dry camping and no hookups, it changed a lot of our routine. We had very little of our normal items, having to run the generator for power, making coffee, etc. We rationed our water, making sure we did not run out, and just a different feeling along this journey. 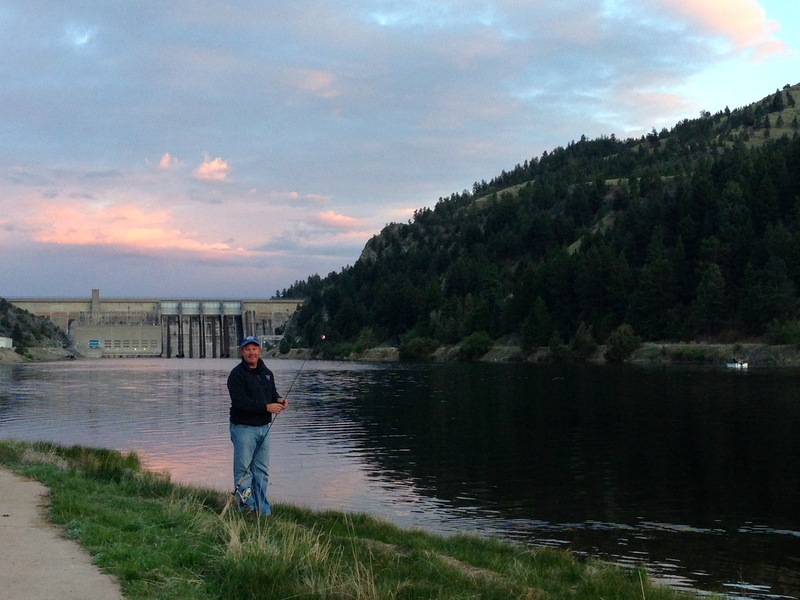 I got my Montana 2-day fishing license and spent a lot of time on the river, when the wind was down, and caught a couple pretty Rainbow Trout. There were a lot of people on the water and along the shoreline fishing the whole time we were there, clearly a favorite place for the Helena locals. Our amazing spot at the Riverside Campground, doesn’t get any better than this! We took a drive one day, turning out of the campground and heading up a dirt road over the hill towards the tiny little town of York. There was a lot of fire damage around. The majority of the people living out here seem to want to get away from society. I could see how someone wanting to hide could get lost in the hills around this area. After driving to the end of the road outside York, we went the opposite way to cross back over the Missouri River and found a great campground with an even better viewpoint above it, some fantastic views for sure. We returned to the MoHo for an evening campfire and dinner, with the peace of no electronics. The TV was off and my phone had started to act up so it was off, a strange quietness. I was glad we made this stop, albeit for only two nights, a stop that felt much more like camping than what we have been experiencing this trip. 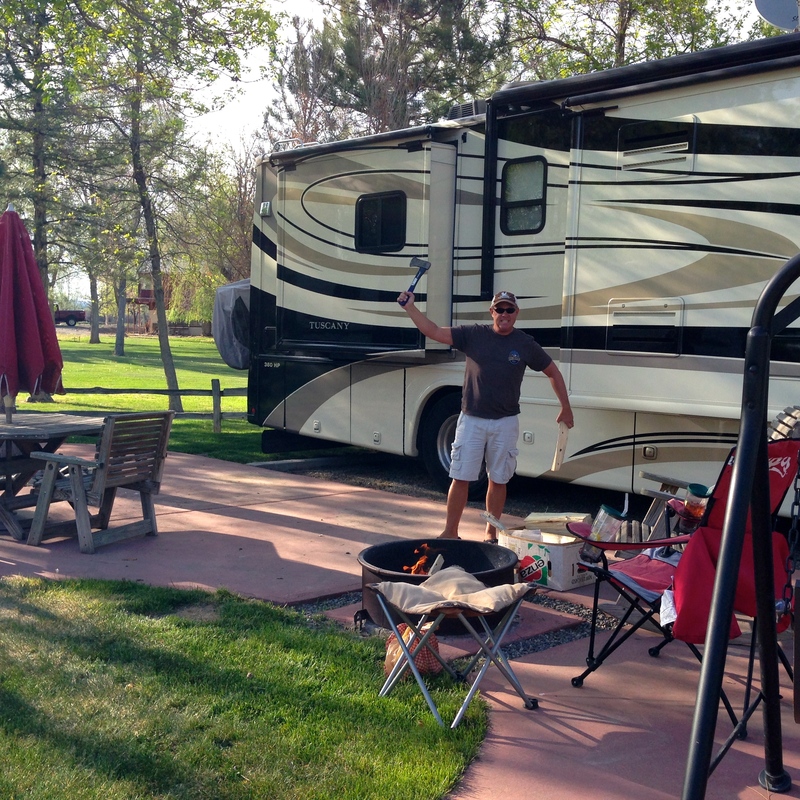 Our next destination was the Polson Motorcoach Resort and KOA, a very nice campground. We had visited this area a few years ago, staying way up on the north side of Flathead Lake nearer to Kalispell, so it was somewhat familiar to us. One of the first things we needed to get done was figuring out what was going on with my phone. We hit the Verizon store first thing when it opened and had some amazing customer service from the manager Shanice. She ordered my new phone, set to arrive the next afternoon. 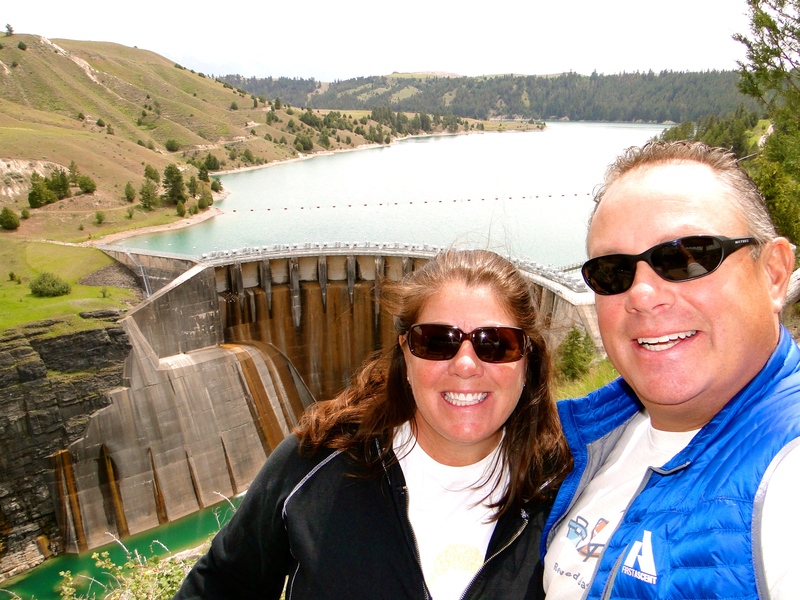 After a great greasy lunch at Swanees, we drove south to the Kerr Dam just outside Polson. We walked the 350 steps down the trail to the overlook of the river and dam complex. After a few photos, we returned to the car, both huffing a puffing from the trip up those very same steps. We returned to the MoHo for dinner in and to enjoy the views from the park. 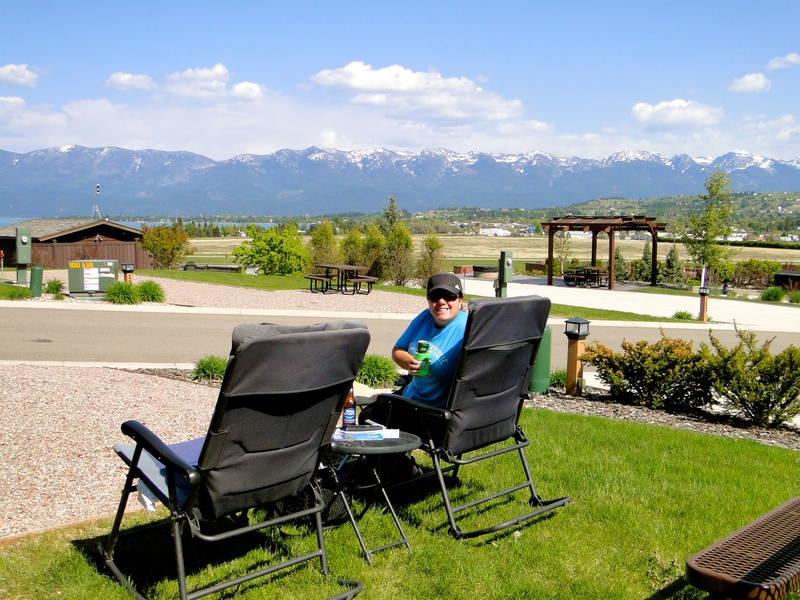 The campground is very well laid out, located on the western side of town overlooking the local airfield and lake with the mountains in the background. It is one of the prettiest places we have stayed in a long time, and with the familiar feel of the northwest! Looking down on Kerr Dam and Flathead Lake/River. It is taller than Niagara Falls. 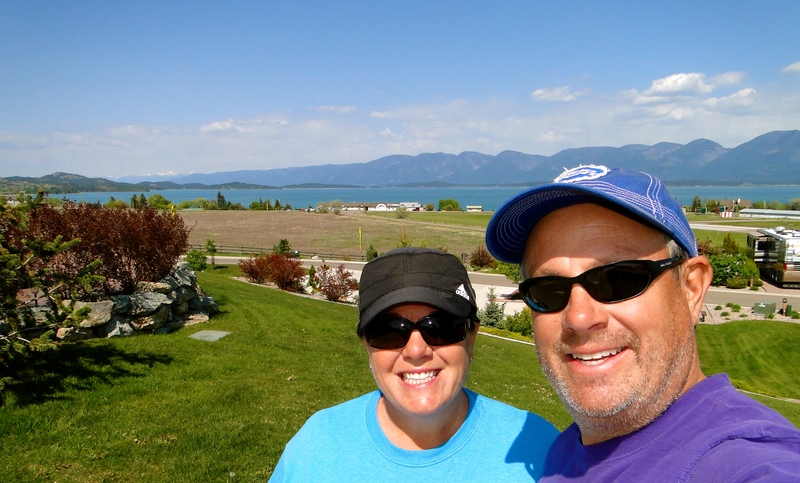 The next day we made the drive up the east side of Flathead Lake towards Big Fork. We had visited here before, but wanted to go back. The day was good for driving, not warm or wet, but a good day for sightseeing. We made a couple stops at the local breweries in the area, the first one at Flathead Lake Brewing and a great IPA I very much enjoyed. Then we proceeded into Kalispell, stopping at the Kalispell Brewing Company, just missing their free glass giveaway for that day, celebrating American Craft Beer week. My stomach was growling, and that was on purpose, as I was looking forward to our next stop, the Moose’s Saloon for pizza and ice cold beers. It was just as we remembered, we left full, and headed back to Polson to get my new phone, set to arrive that afternoon. We picked it up, then returned to the MoHo for the night. A great day driving around gorgeous Flathead Lake. The next morning was wet and cool, one of those days to just hunker in for awhile. Traci woke up and asked for some coffee. When I went to make it for her, our worst nightmare was clear, we had a mouse in the MoHo! I spent the next 90 minutes cleaning up the kitchen area cursing myself, as I had bought some traps a week ago thinking there might be a little guy in the storage area, but never set them, damn! We had run into several people along the trip that had this happen, and I knew I could get it handled; it just put a downer on our stay quickly. That night I set the traps, and the next morning we had our culprit, sorry little guy. We did some additional cleaning and left the rest of the traps out in the MoHo, hoping he was a loner. 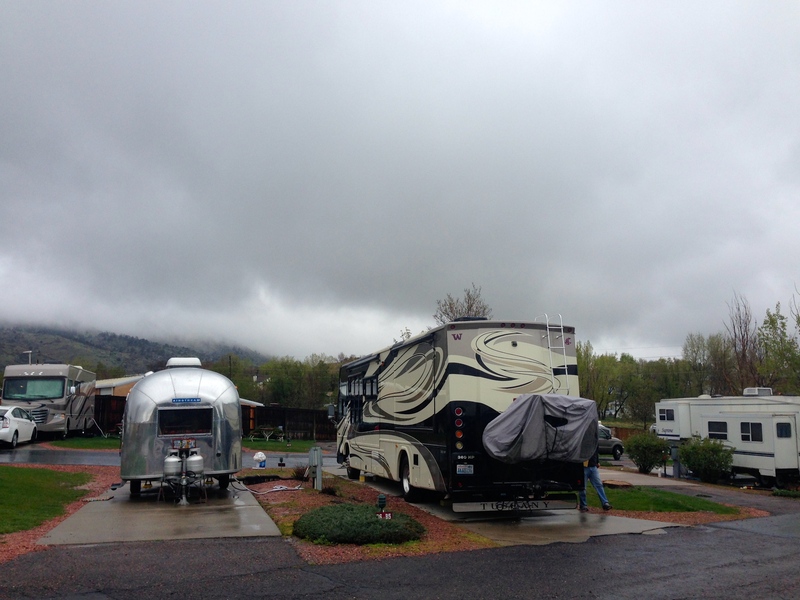 The next morning, with no new vermin, we made our way to our next stop, the Missoula KOA. We got set up quickly, and decided to take advantage of the nice day and take a drive into town for some exploration. We headed to the campus of the Univ. of Montana, a neat place located right up against the hills on the east side of town. We stopped at Kettle House Brewing, packed with a biking tour group on a brewery ride around Missoula. It was also graduation weekend, so there were a lot of people celebrating everywhere we went. 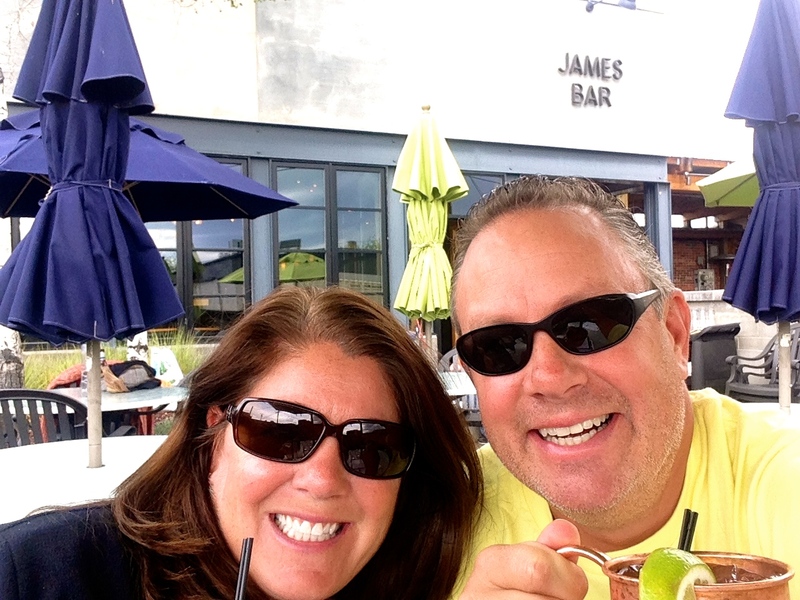 We made our next stop at a place called the James Bar for linner and happy hour, and it was very good food and beverages. We returned to the MoHo for the night, liking this place already. Our last full day in Missoula, we started out early and hit the farmers market on the river; lots of veggies and some produce, and tons of people out enjoying the morning. We wandered up into town, and came across two more outdoor markets, one just crafts, and the other foods, all within about a 10-block area. 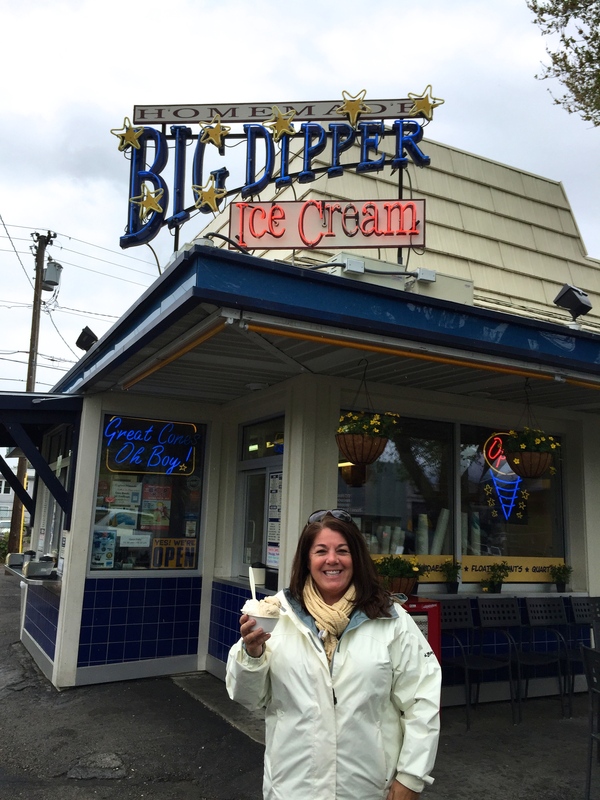 We stopped at Big Dipper Ice Cream, nationally known, for a tasty treat. The weather started to get wet, so we decided to find some breweries, and there were plenty of choices. 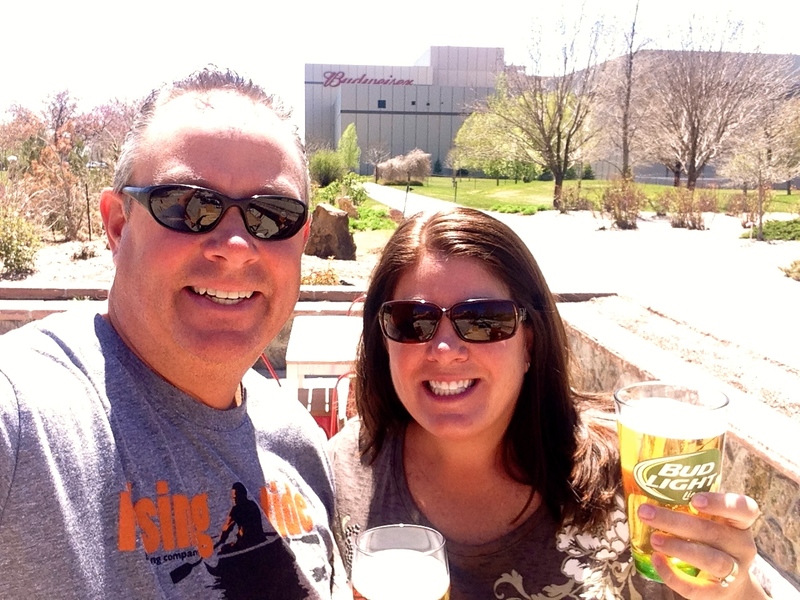 We found three places along our afternoon travels, finishing at Big Sky Brewing by the RV Park and free samples! As you can tell, Montana definitely has a great craft beer scene! We returned to the MoHo for the night, realizing that this was the two-year anniversary of our departure from home on this adventure, and coincidentally our last night we will spend outside of Washington State. 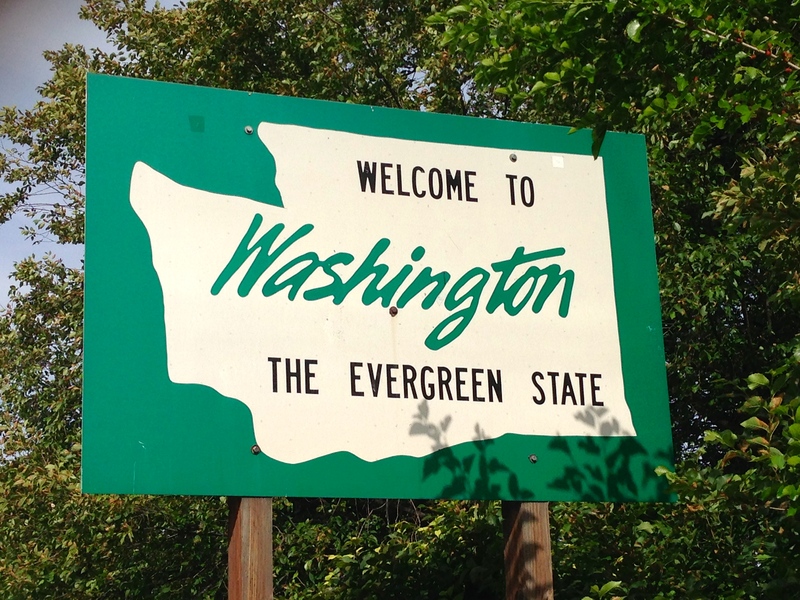 Next, we head to Clarkston, WA for a quick stopover before visiting friends in Walla Walla, Yakima and Wenatchee. The adventure is nearing its end, and it sure has been amazing, beyond what we could ever put into words! 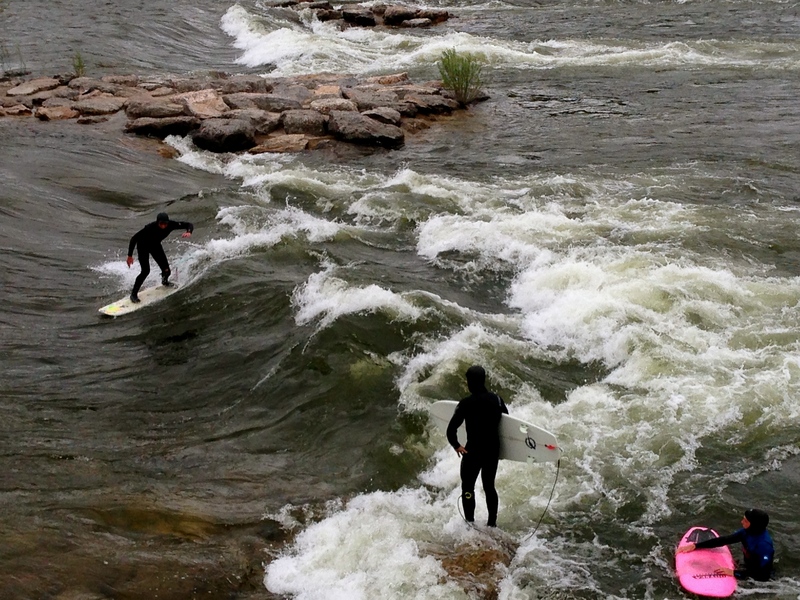 This entry was posted in May 2015 and tagged big dipper ice cream, Billings, boon docking, Bozeman, Cinco de Mayo, Craft Beer, fishing, Flathead Lake, Helena, KOA, Missoula, Montana, Polson on May 17, 2015 by Mike. 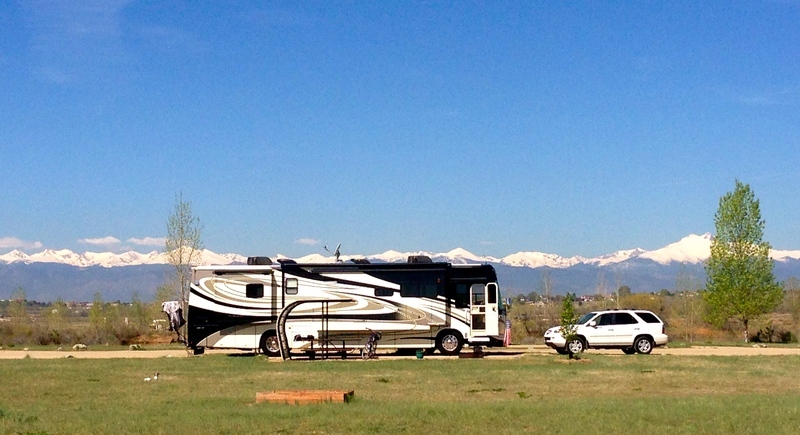 Our campground at St. Vrain State Park – hello Rocky Mountains! I really do love Colorado. We came through almost two years ago in June/July 2013, so were excited to be here again to see friends. 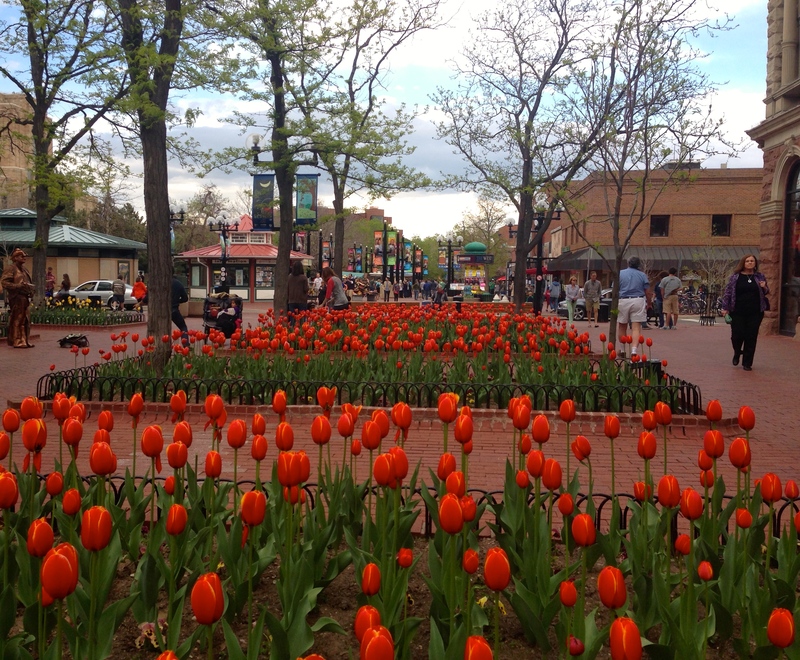 However, Colorado in springtime is a bit of a different story than in the summer. It had snowed a few days before we arrived and for the first 4 days it was cold, rainy and stormy. With that came my first sickness of this entire 2-year trip, a bad head cold. Dang. 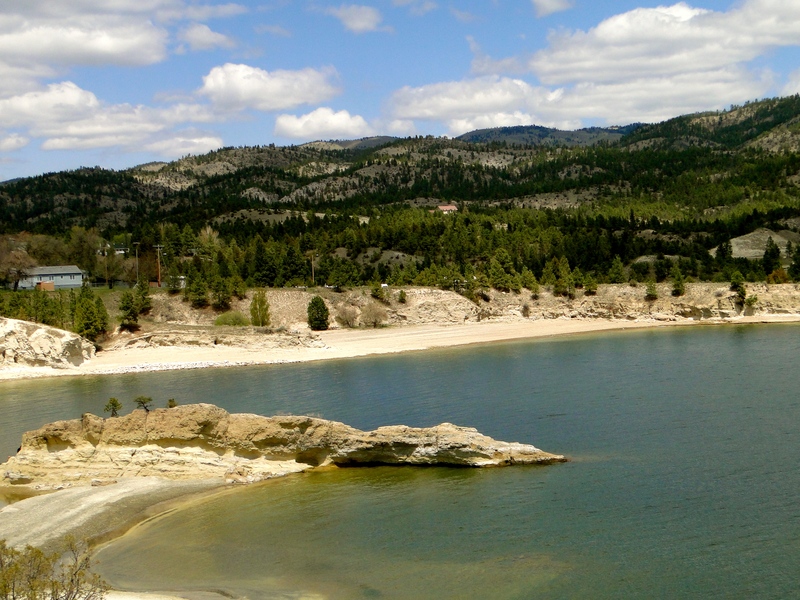 Our first destination was Golden, just west of Denver, and the Dakota Ridge RV Park. 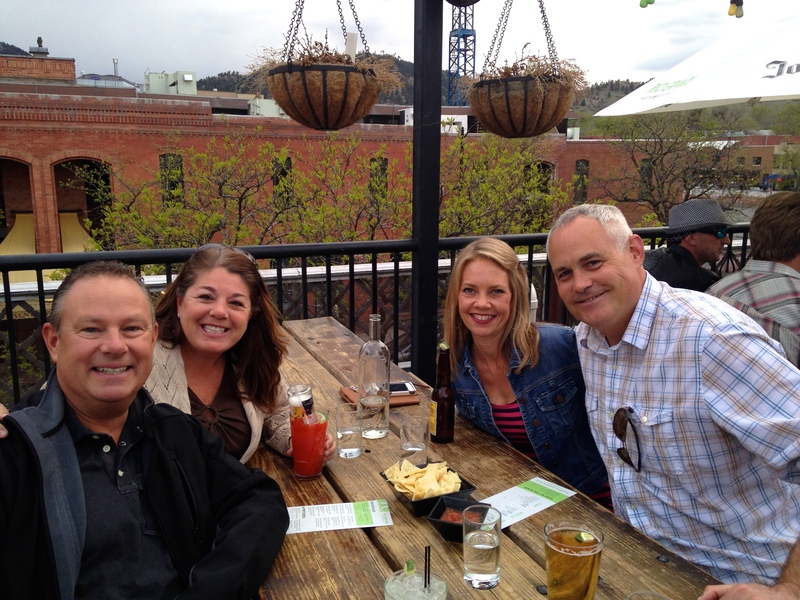 We got settled in then made contact with my college friend, Ron, and hatched a plan to meet that evening at Mountain Toad Brewery in Golden. It was great to see him and his son Tyler (his wife was in Paris visiting her aunt) and catch up on the past few years over a few beers and a killer burger from the local food truck. The next day I was down for the count with my cold, but rallied that evening. No choice! Ron picked us up on his way home from work and took us to his house, just up the hill from where we were staying. He actually had snow on the ground up there! We then drove back into downtown Denver, parked at his office, and started our evening. 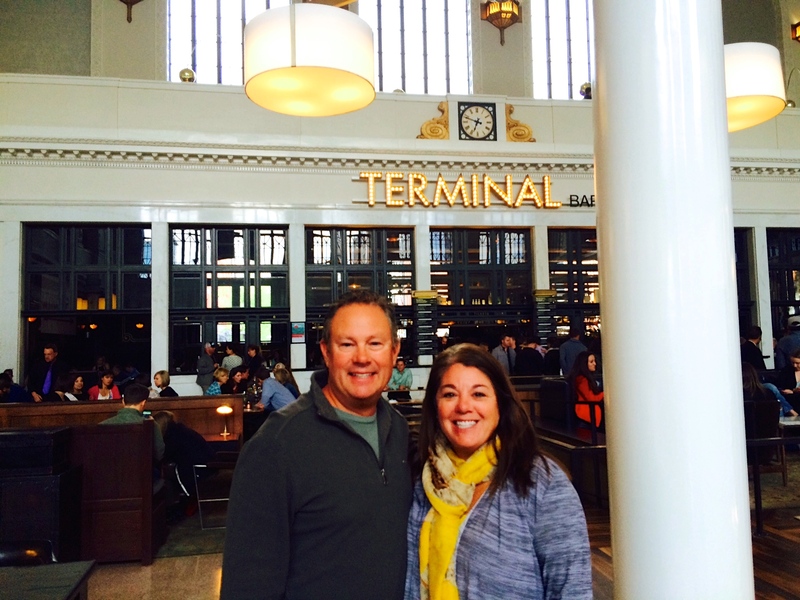 First stop was Union Station, a functioning train station that has been renovated as a very cool, hip, bar. Loved the concept! 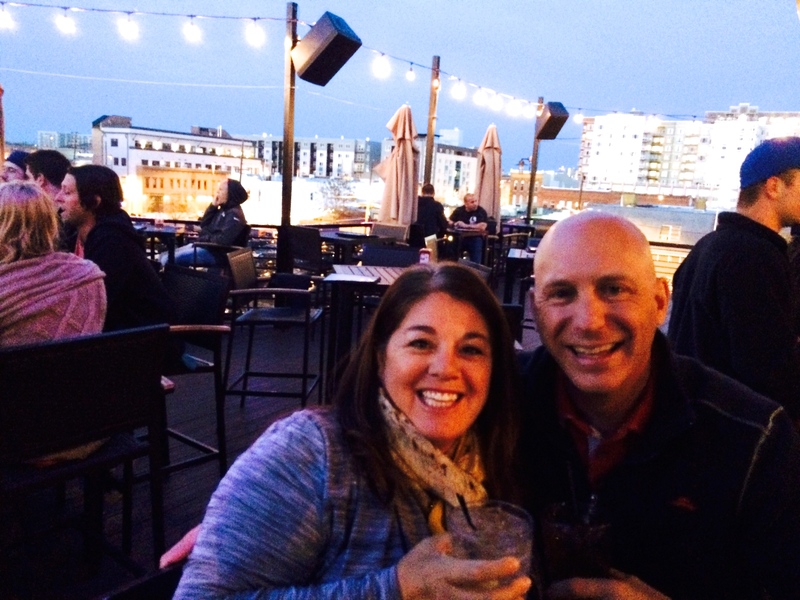 Next, we hit Machete for gourmet tacos, then ended up at the rooftop bar of the Viewhouse. There was a Rockies game going on and we actually had a view of the stadium from the bar. As always, had a blast with Webert and loved being back in a bigger city! The next day we had plans to meet up with other friends, Lori & Bill. Lori is a sorority sister from WSU. They were staying in Boulder for the night, so we headed up to meet them. We got there early and walked around Pearl Street, then met them at their hotel bar. We hit a few spots for cocktails, then had a delicious Italian dinner at Pasta Jay’s. It was prom night in the area, so was fun to see all of the kids dressed up for their big night. My cold had really kicked in, so we said our goodbyes and headed back to the park. I love that no matter how much time passes, we can just pick back up where we left off. Bummer that we didn’t get to see their darling girls on this trip. We woke up Sunday to horrible weather, a good day to just bundle up and hunker down and try to beat this cold. Ron called to check in with us and we ended up meeting him and Tyler for lunch at a place right up the street, then they came back to the MoHo to watch some hockey. They headed home and we stayed in the rest of the day checking items off our to-do list! Interesting to note that we haven’t turned the a/c on since Florida and have had the heat on most of the time. Monday was moving day for us. 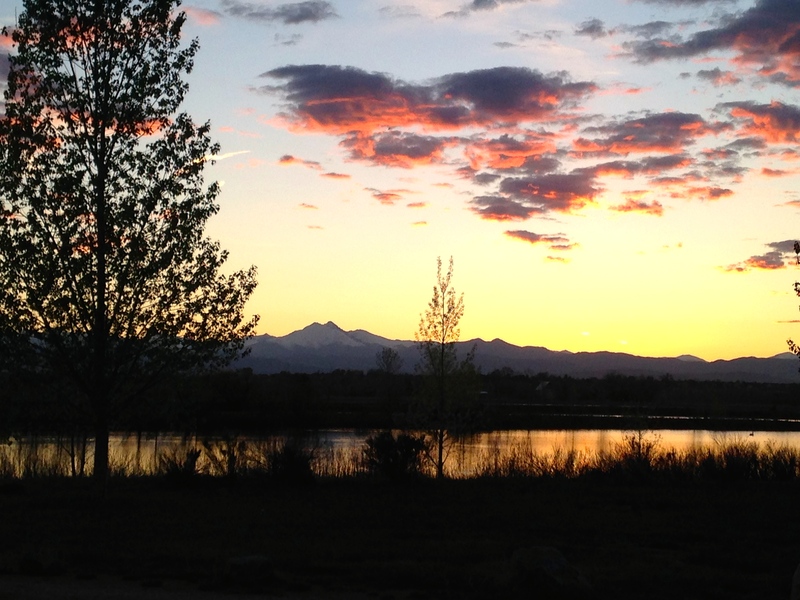 We headed north about an hour to St. Vrain State Park in Longmont north of Denver. This park was the complete opposite of where we had just been. From an expensive, crowded, city-like park to a wide-open spread out retreat surrounded by lakes. Since we had a short drive, we were up there by noon all set-up. 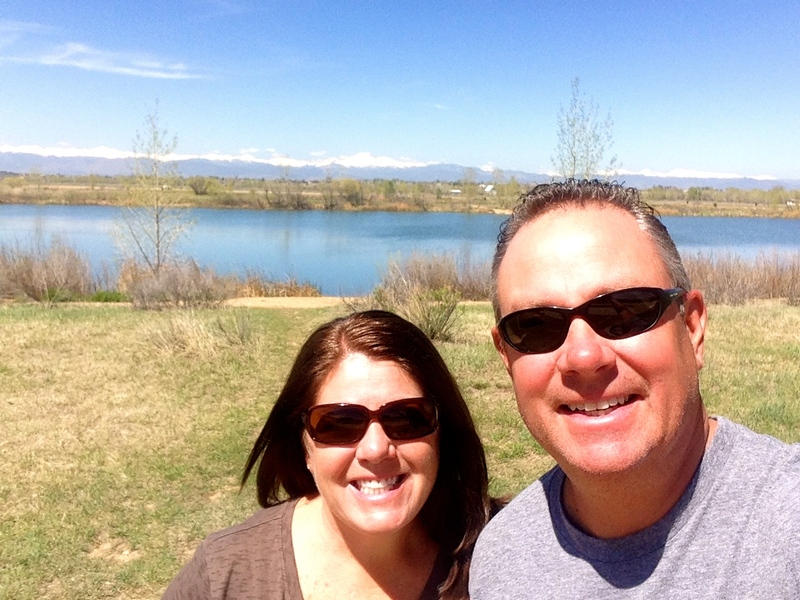 This park was close to our friends, Jen and Rod, who live in Broomfield. 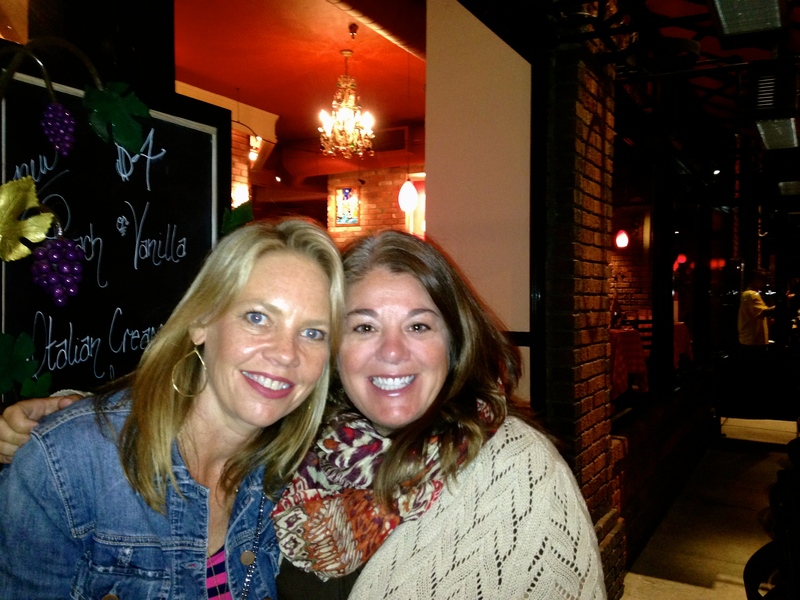 Jen is a great friend I used to work with at Holland America. We had plans for dinner at their house that night and were looking forward to seeing them and their kids Jordan and Bella, plus new baby Katalina! It was nice to just hang out at their beautiful home, catch up over a home-cooked meal! We didn’t stay late as this was a school/work night for them. Woke up the next morning to sunny, clear skies and a view of the Rocky Mountains that was amazing. Finally! Feeling better already. I went for a much-need haircut/color from Jen’s friend and Mike fished all day on the lake. All is right in the world! 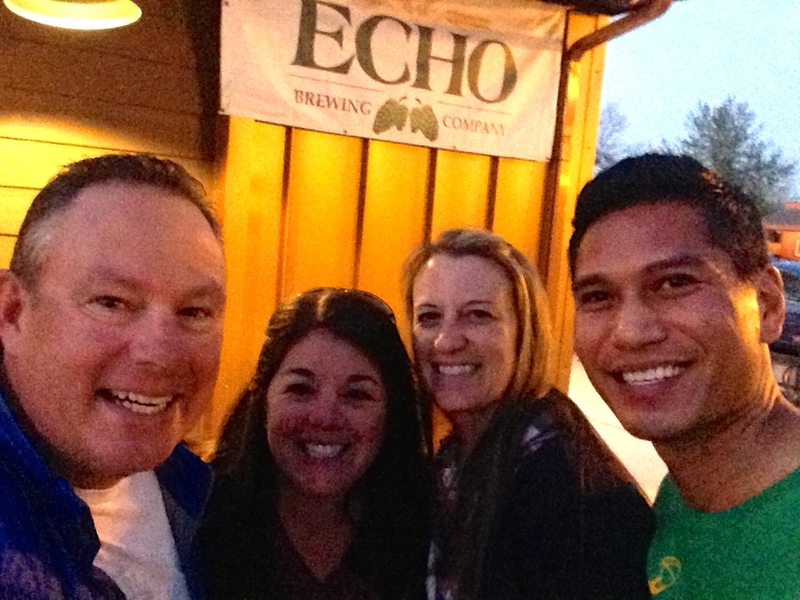 Met Jen & Rod at nearby Echo Brewery in Erie for beer and pizza that night, then said goodbye to them. Time just goes by so quickly! The next morning was another glorious sunny one and we decided to drive north to Ft. Collins for the day and check out some more breweries. A theme is forming. 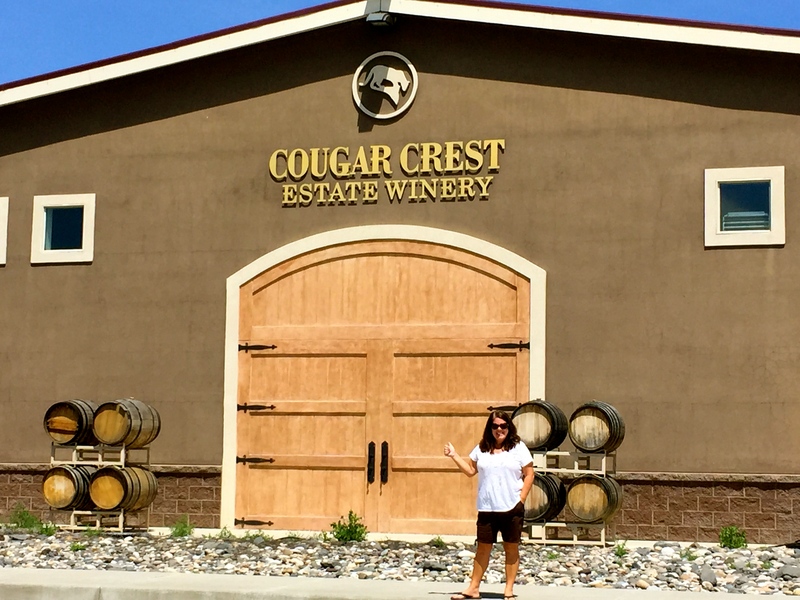 Colorado is the Napa Valley of Breweries. More here than we could possibly visit. We stopped at Anheuser-Busch and were lucky that the Clydesdales were home. A very nice facility and biergarten. 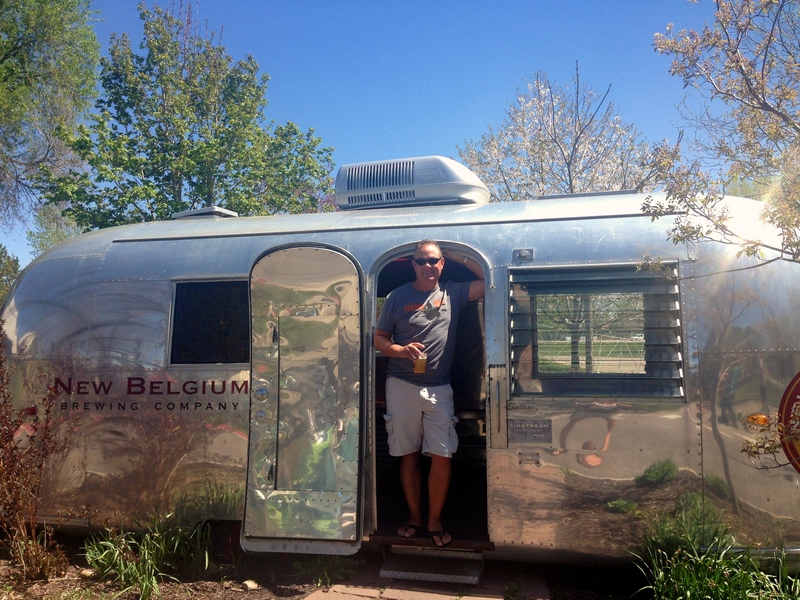 Next stop was New Belgium, which had a great outdoor setup. Lastly was Coppersmith Brewery & Pub for lunch on the patio in downtown Ft. Collins, which is kind of a hippie college town. Good people watching. We headed back to the MoHo and enjoyed a fire outside and a killer sunset. Now, this is the Colorado I had hoped for! 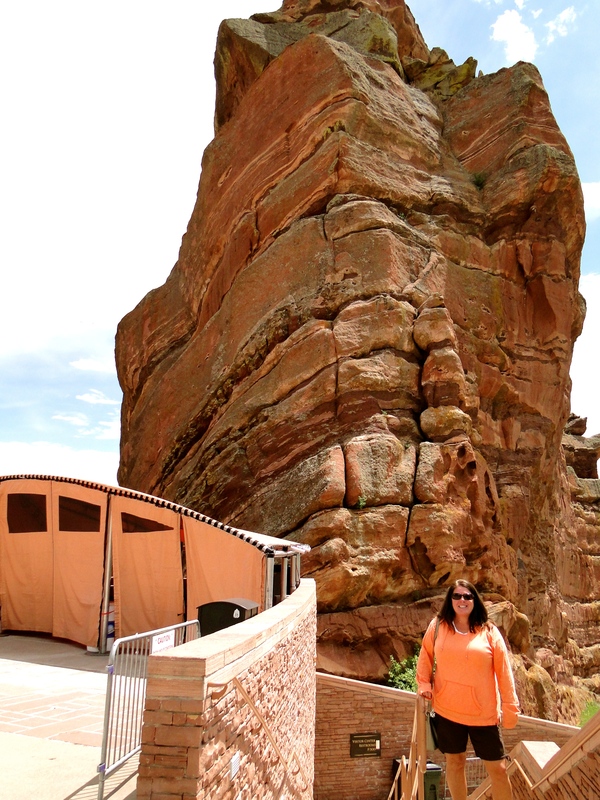 On our last day we headed back toward Golden, right by our old RV Park to Red Rocks Amphitheatre. We had hoped to visit when we were actually staying in Golden, but the weather was so horrible, it wouldn’t have been worth it. But, today the sun was shining, so it was a perfect day to check out this unique concert venue. 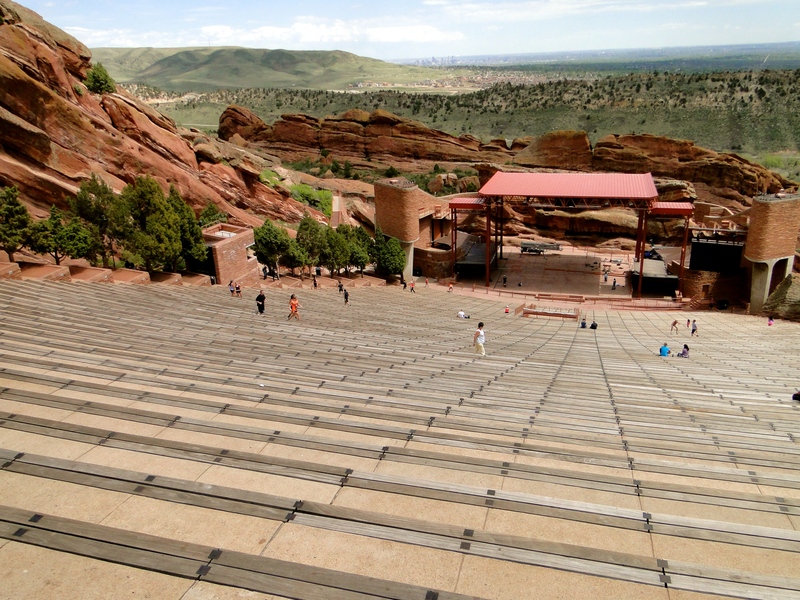 During the day, it is used by many as a workout venue; pretty impressive to see people bounding up the steps. We walked around leisurely and enjoyed the amazing views, picturing what a great place this would be to see a concert. 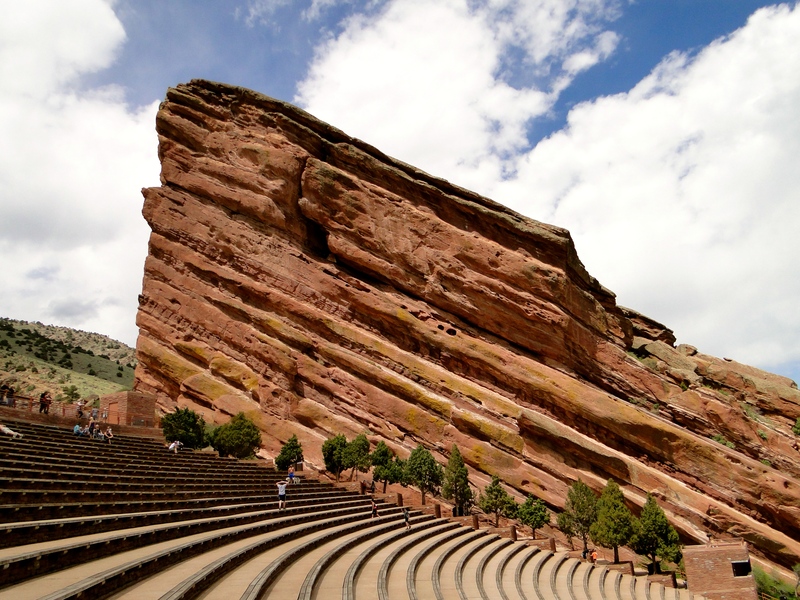 In the visitor center we learned that the venue is the largest attended amphitheater in the world. It is a relatively small venue, but their season is much busier and longer than say the Gorge in Washington. 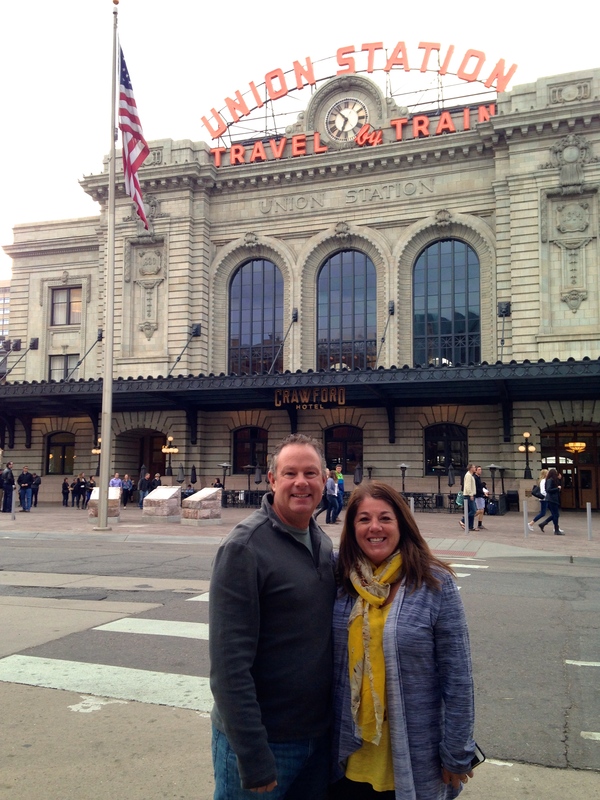 We decided to head into Denver to check out a few more breweries. We drove-thru the Denver Broncos stadium lot with our Seahawks magnets on the car, then off to the Brewery Trail. We hit three of the top-ten list that I had – Strange Craft, Renegade then Wit’s End. The last one is owned by the cousin of my good friend Joe, so it was fun to visit it again (we had been 2 years ago). Ron actually came out and met us there, then he bought us dinner at one of his favorite pizza joints, Pasquini’s. It was a great day with the sun shining, but by the time we left dinner, the stormy weather was rolling back in. 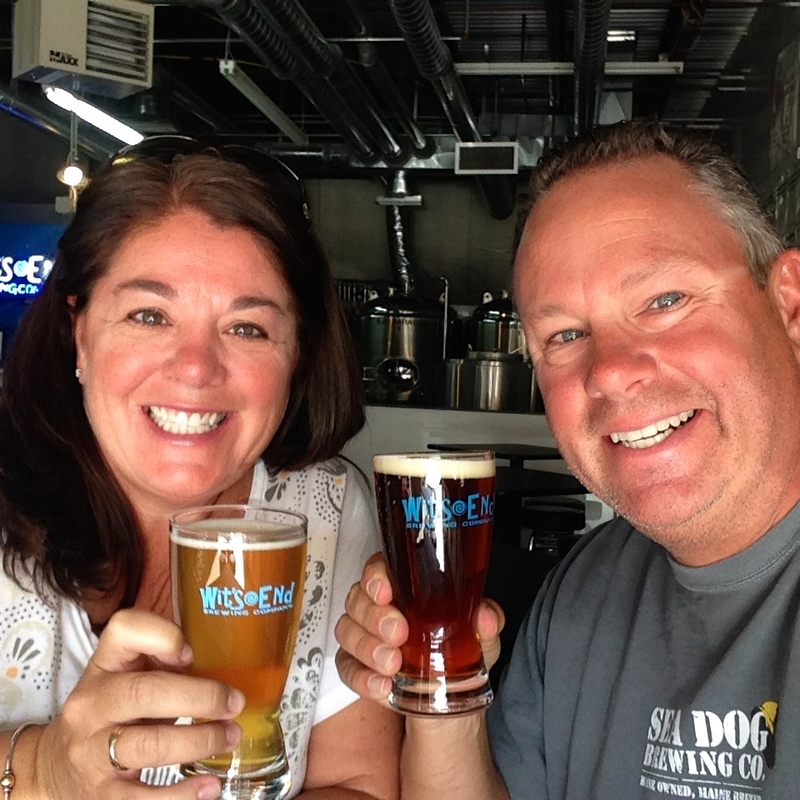 Wit’s End Brewery – cheers Joe! 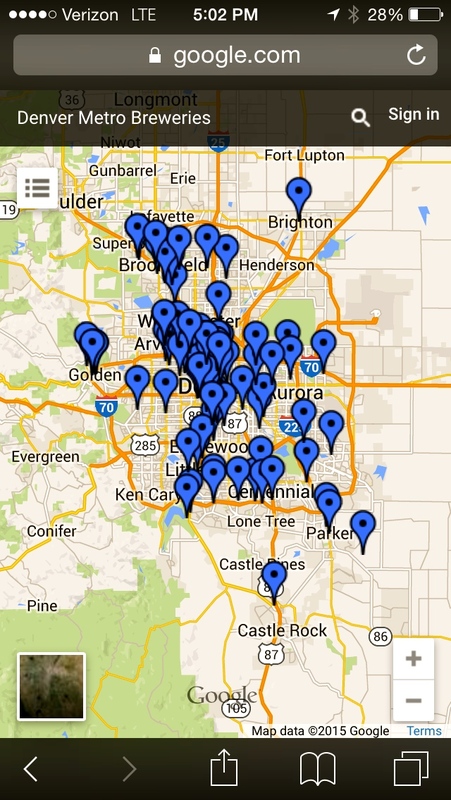 This map shows how many breweries are in the Denver area – wowza! We actually tried to extend longer at our park, but it was full up for the weekend. Denver really is a great city and one I could see myself living in. But, it was time for us to keep moving and continue our trek north. 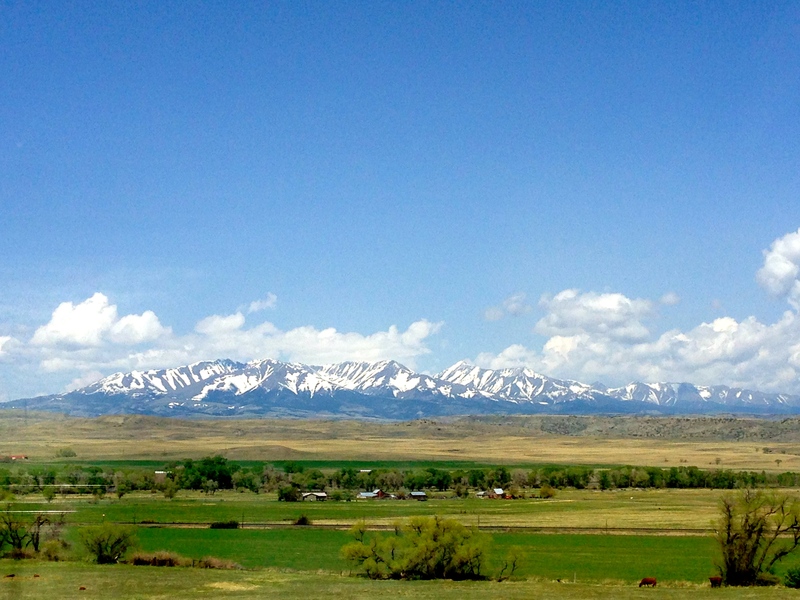 After researching Wyoming, we felt like there really wasn’t much to see up the center of the state. 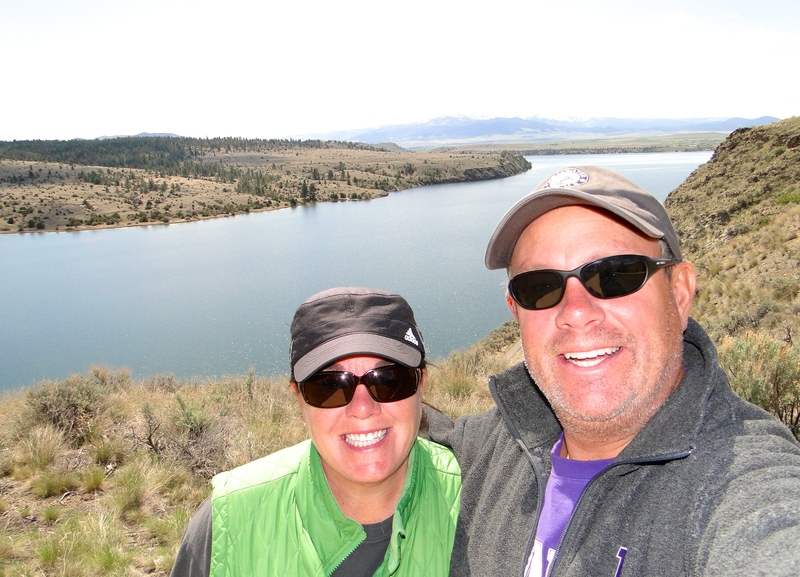 We had already hit Jackson Hole, Grand Teton and Yellowstone the last time we were through. So, we drove most of the state in one day and it was beautiful country but pretty desolate. Wyoming is the 9th largest state by land area, but 50th for population (563,000). I think we saw more Pronghorns than people. Our 2-night stop in Buffalo, WY was a good one where we mostly relaxed. We checked out the small town, watched the Kentucky Derby and caught up on laundry. Sometimes you need these types of stops. Next up we have Montana then yes, back in Washington. We are actually starting the process of looking for a place to live and it probably is time to get the resume refreshed. I don’t feel ready for reality yet, but I guess it is time. Anyone out there hiring? 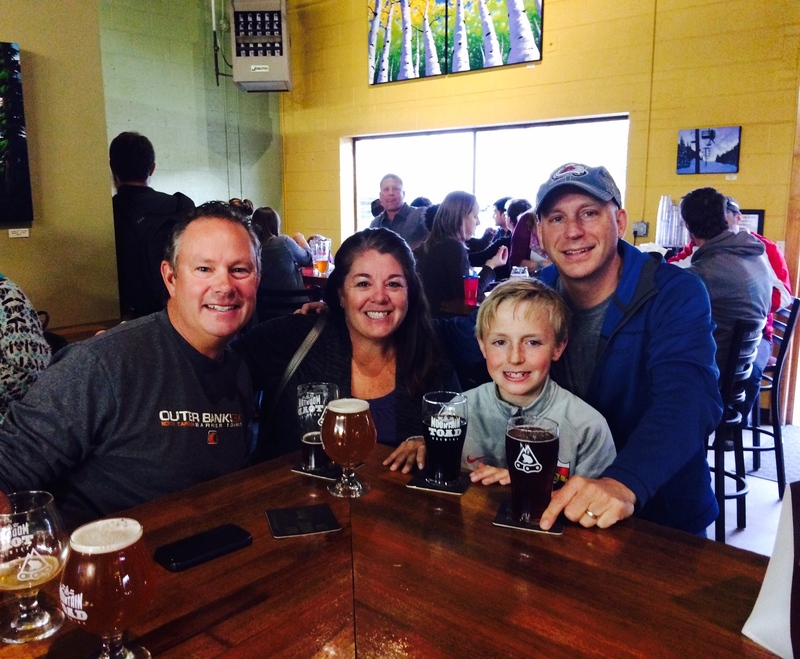 This entry was posted in May 2015 and tagged Boulder, Colorado, Denver, Denver Breweries, Golden, Red Rocks, St Vrain State Park on May 4, 2015 by Traci.